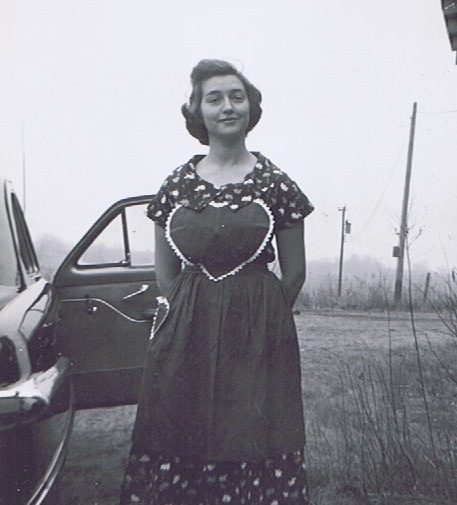 And the tutorial for the heart apron she’s wearing can be found HERE. It should come as no surprise that I have a lot of fabric scraps. Lately, I’ve been playing in them quite a bit, trying to get them organized. That has led to me realizing that I have too many to actually “organize”, and I need to be using them up as I go. 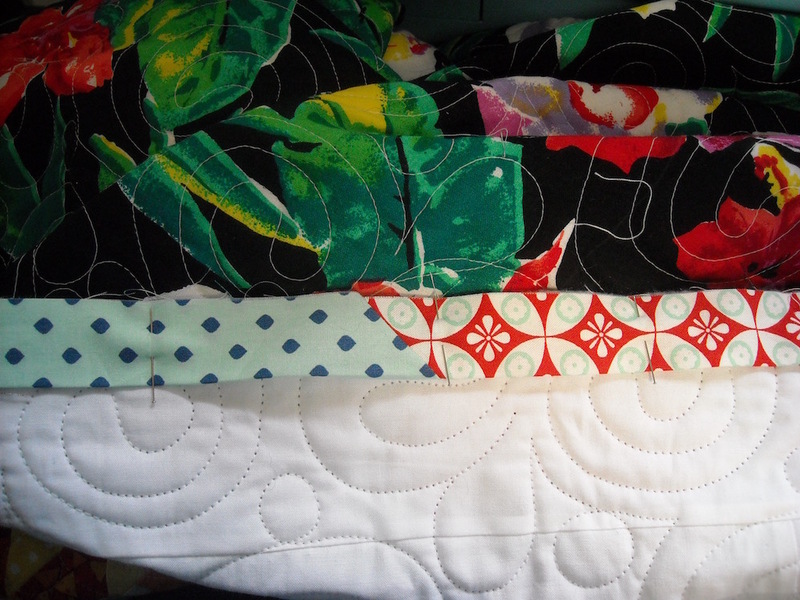 Which then led to me starting several new scrap quilts, which should also come as no surprise! I wrote about one of them today over on my other blog: My Tile Quilt. 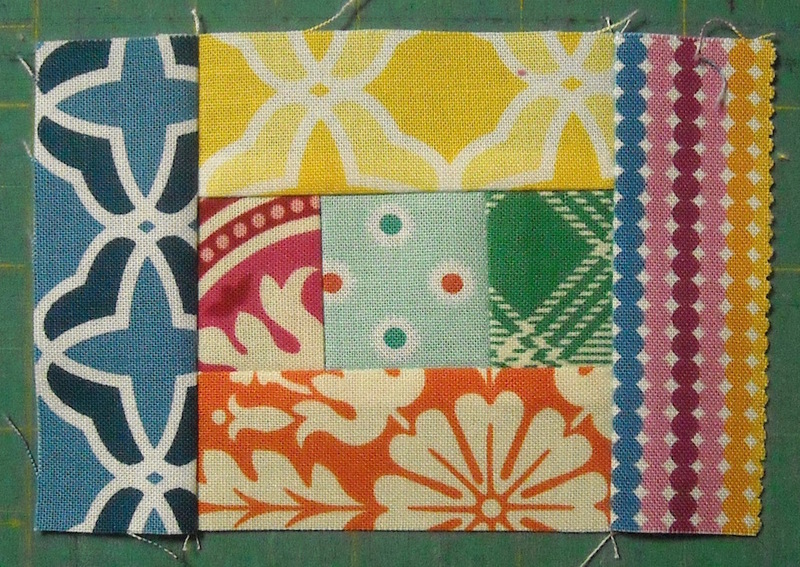 I’m calling this quilt MixMash. It’s a complete mess of any bright scrap I can come up with. 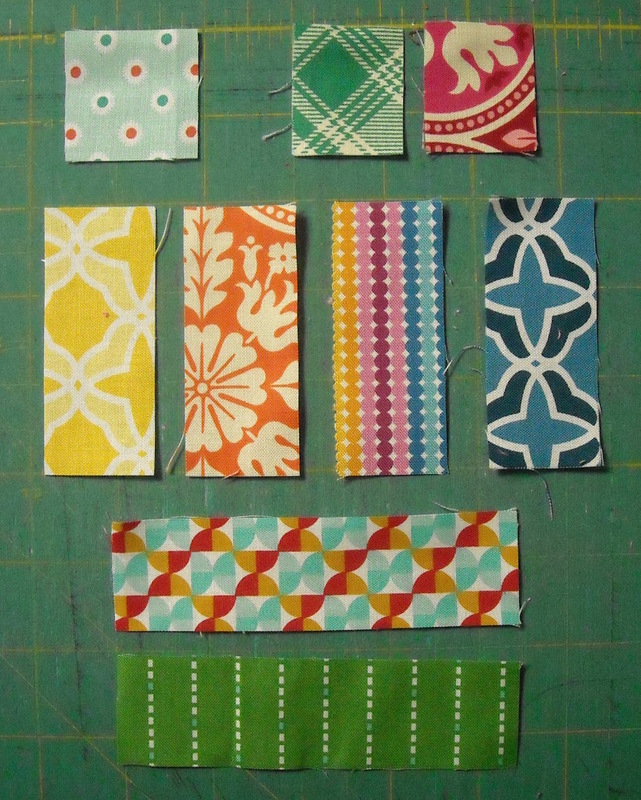 As I’m working through my scraps, I cut them into pre-cut sizes, the smallest of which is 1 1/2″ squares and 1 1/2″ strips. 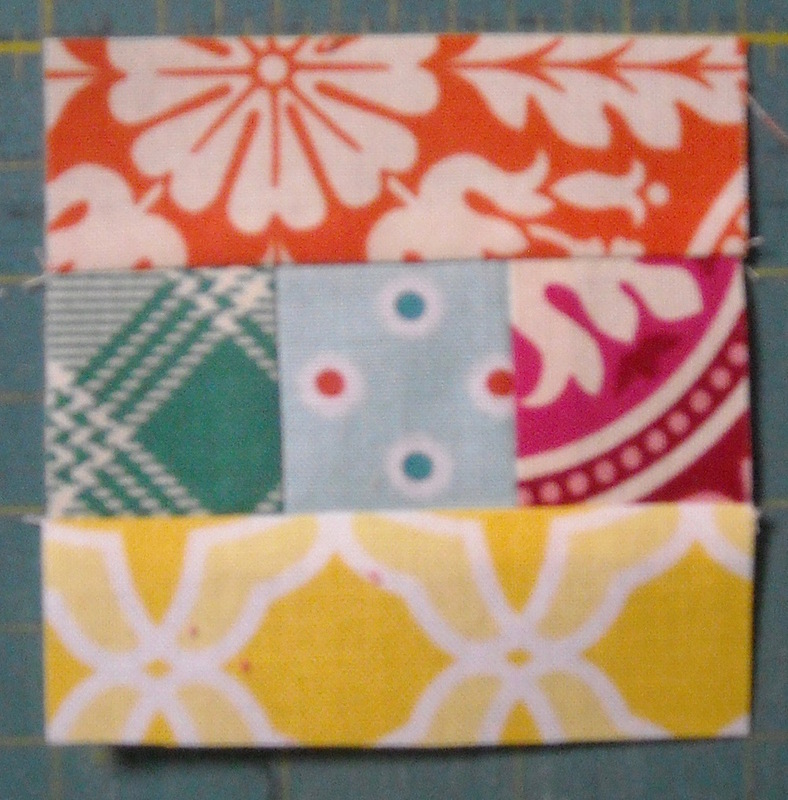 This quilt, however, can use 1 1/4″ pieces, so now I can use up that size as well. Here’s how I’m doing it . 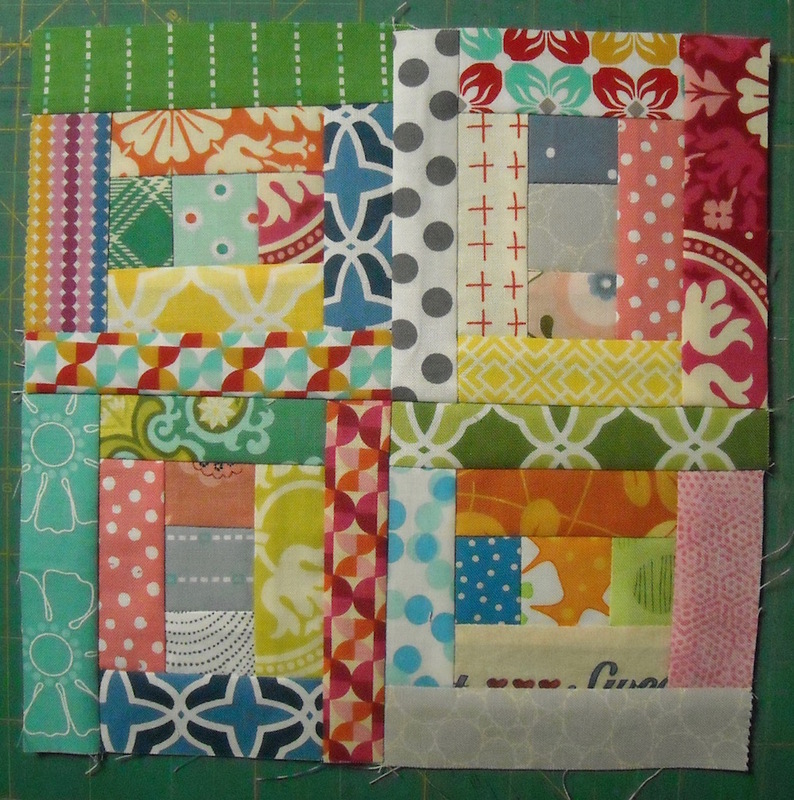 . .
Each little block measures 4 1/2″, to finish at 4″ in my quilt. You may press your seams however you like. It’s that simple! 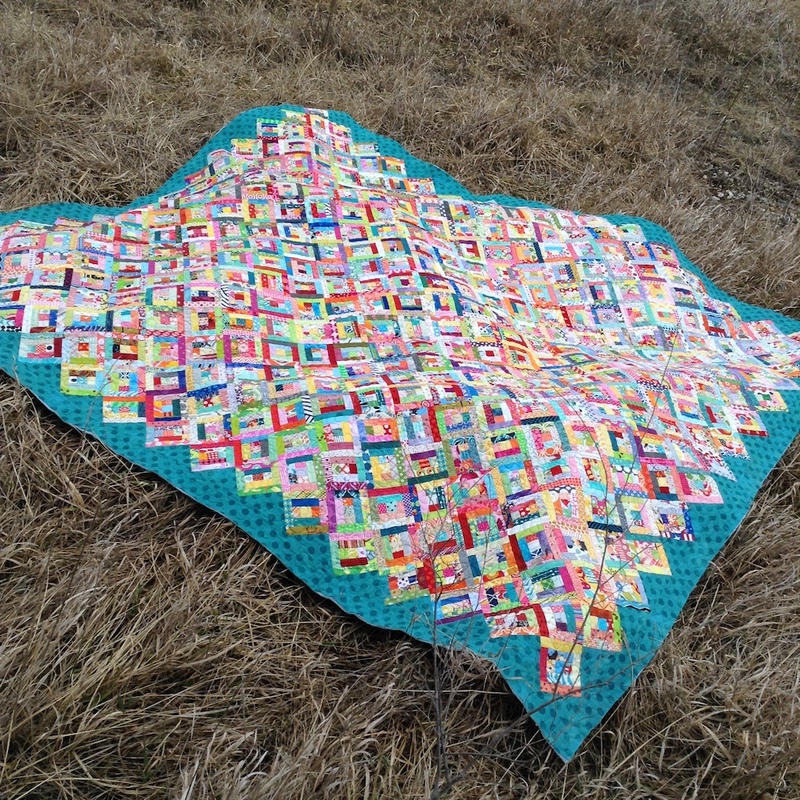 Now you just need to make 400+ of these for a big quilt! It’s basically a small version of a Courthouse Steps block. 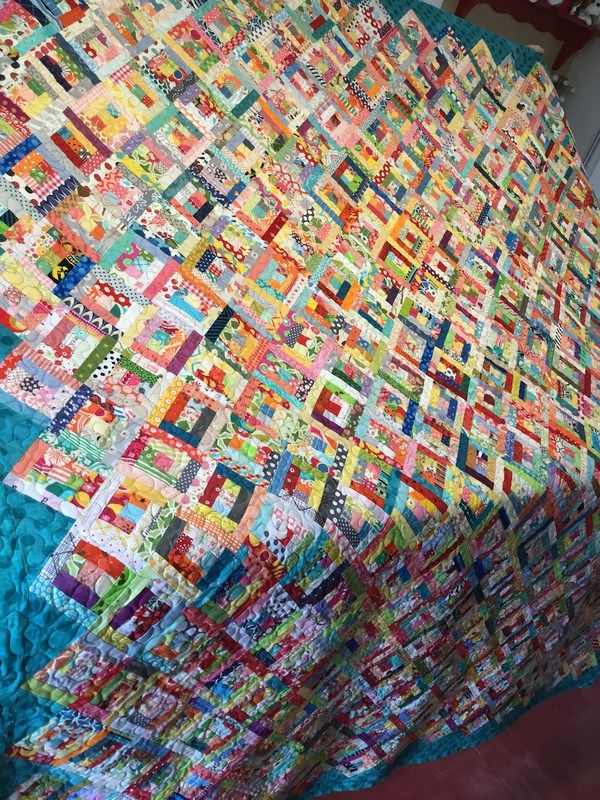 Here’s a few other notes about this quilt . 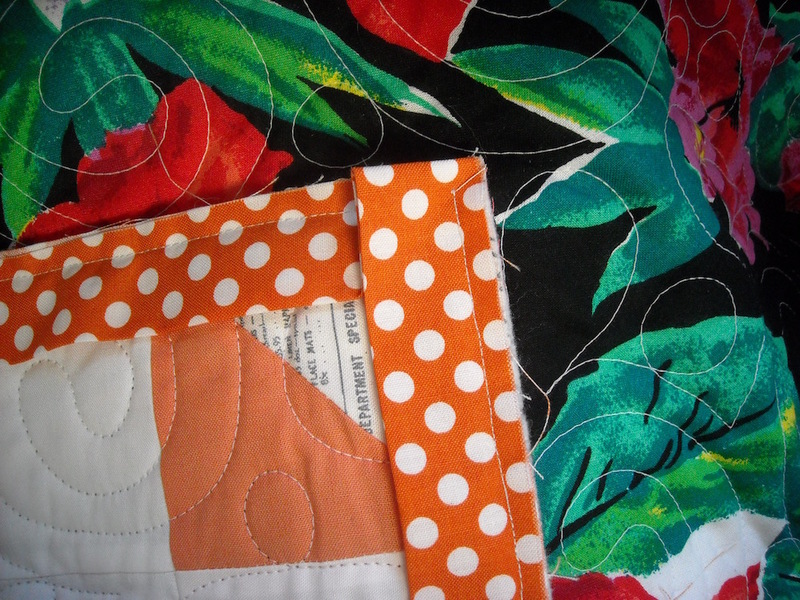 . .
As I’ve been working on the scraps, I cut pieces for this quilt while I’m at it. Then I just store them in these labelled baggies and they’re ready when I am. 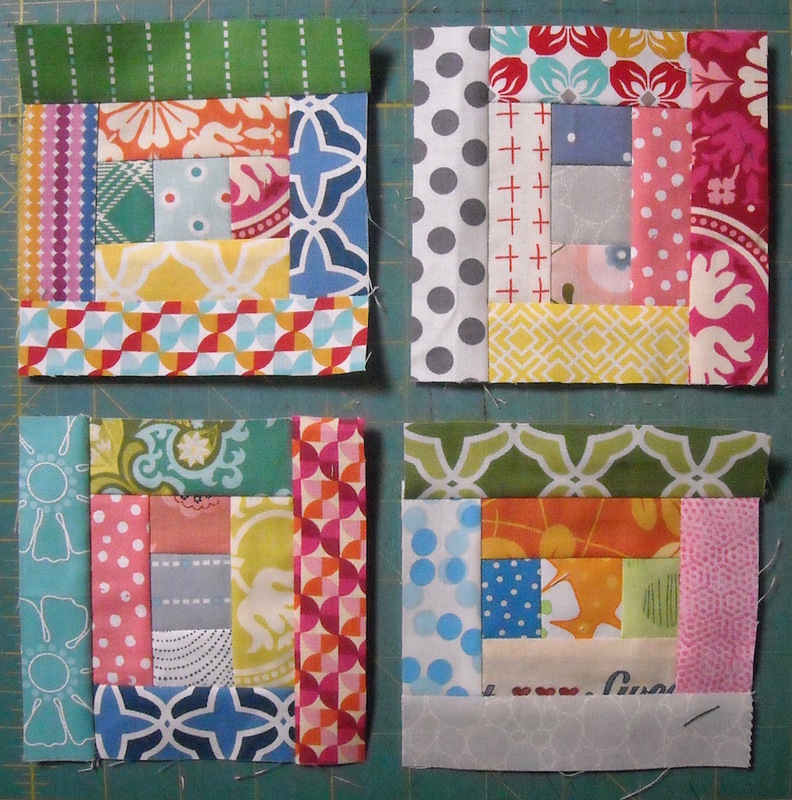 I have another bag to keep my finished blocks in. I’m not really counting how many I have right now. I’m just using up scraps for the time being, and when I get enough that I think I can do something with, I’ll see what happens from there! I’m not planning to join too many of mine together right now. 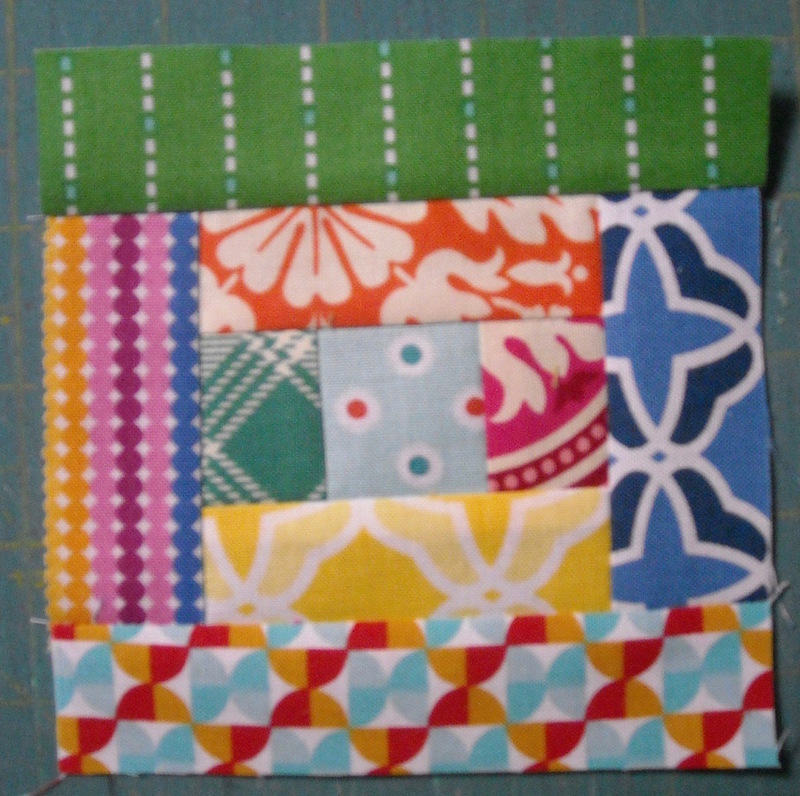 I want to have a lot of blocks made, and then play around with the arrangement so that the color is evenly dispersed. 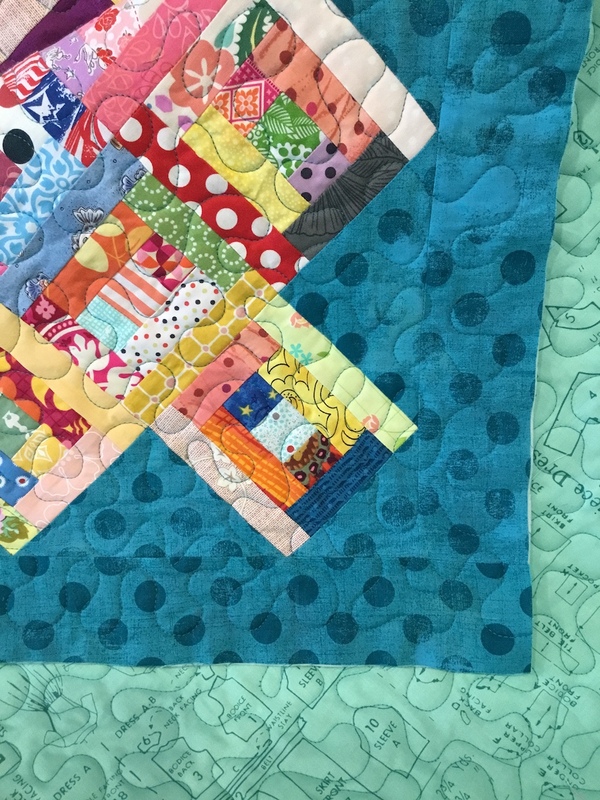 I know my scraps will evolve as I’m cutting, and I don’t want all of one fabric bunched up in one area of the finished quilt. 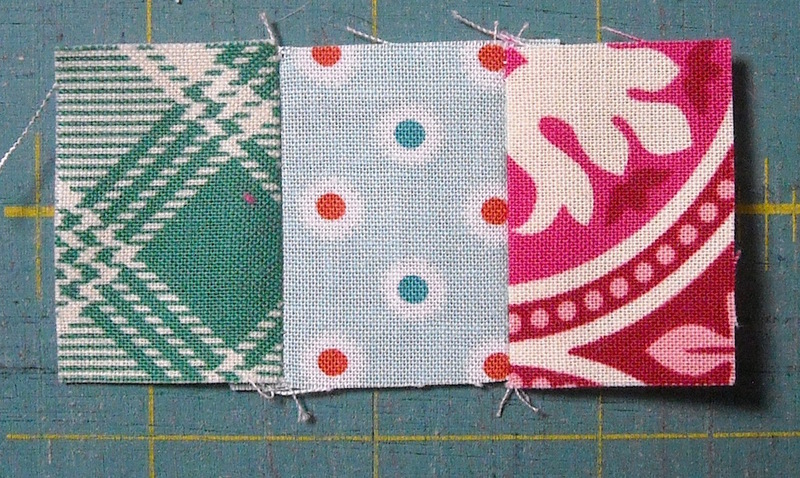 My color choices are completely random — I’m just grabbing and sewing. 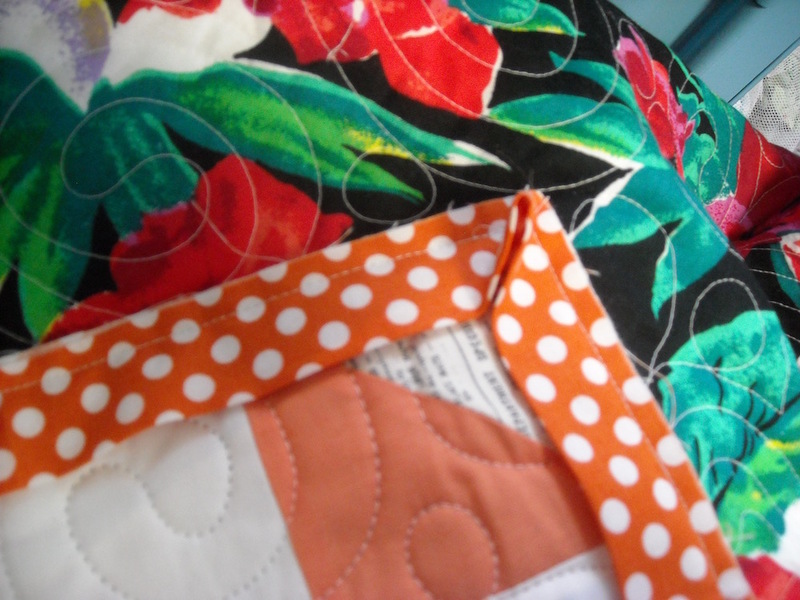 I simply try not to get two fabrics alike right next to each other. That’s what helped me come up with the name! I also plan to set these on point, so when I get ready to do that, I’ll be back with more information on my setting. 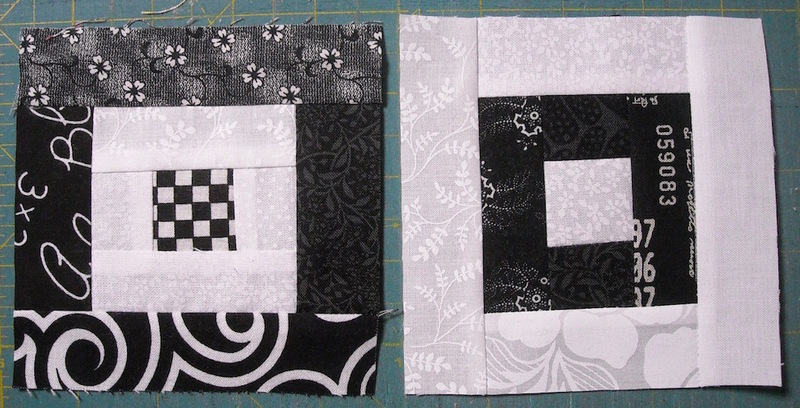 For now, I’m just happily making blocks. They make a fantastic leader/ender project, and you can have a handful of them finished in no time. 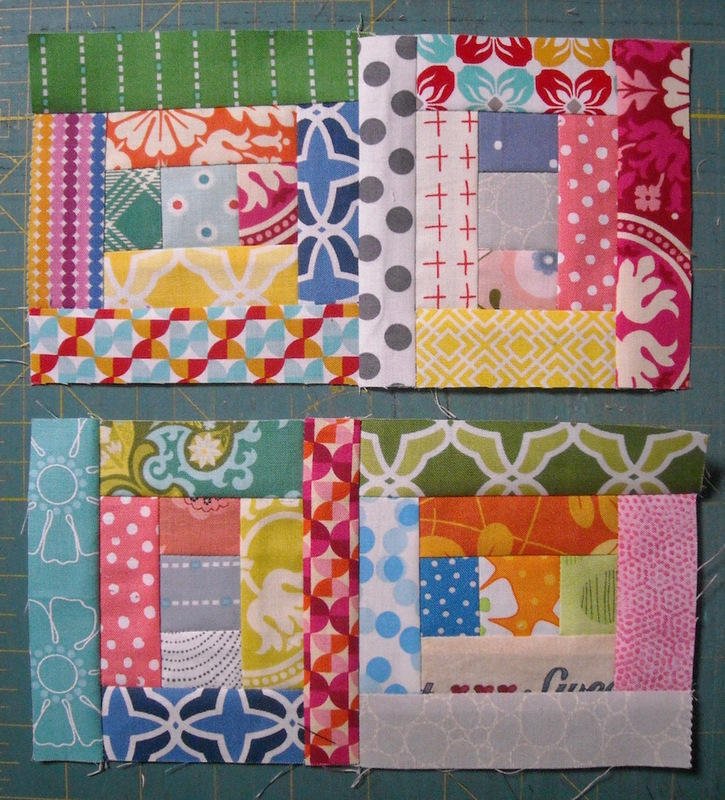 If you need to use up some little scraps, I hope you’ll join me in making some of these blocks! I’m also making a black and white version, in which I’ll alternate the blocks. This one is going to look very “op art” when I’m done. I’m excited to see it come together. A two-color version requires you to be a bit more deliberate in your cutting, but it’s still easy to figure out. If you have any questions about any of this, please let me know, and I’ll try to answer them in a future updated post on this quilt. 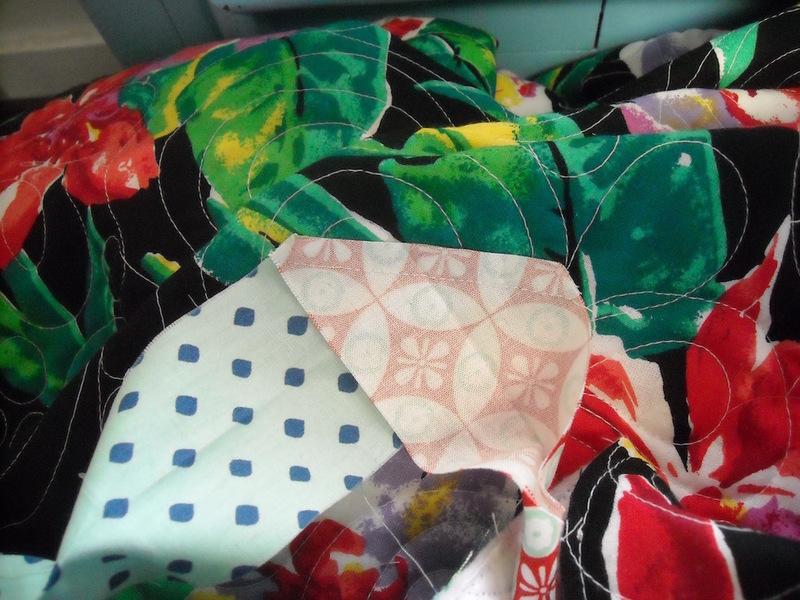 You’ll be seeing these two quilts again as they grow! 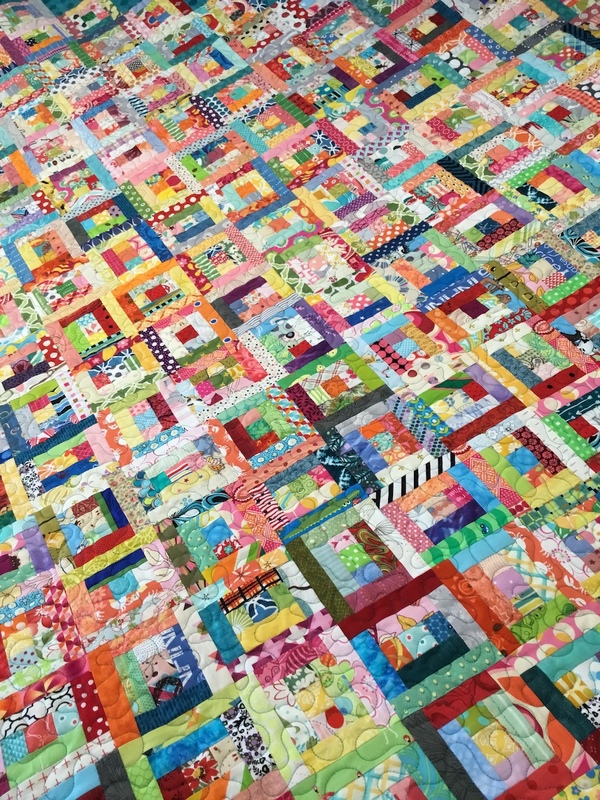 Now that you have your quilt quilted (you do, don’t you? ), it’s time to attach that binding we made a while back. But first, you need to trim your quilt. 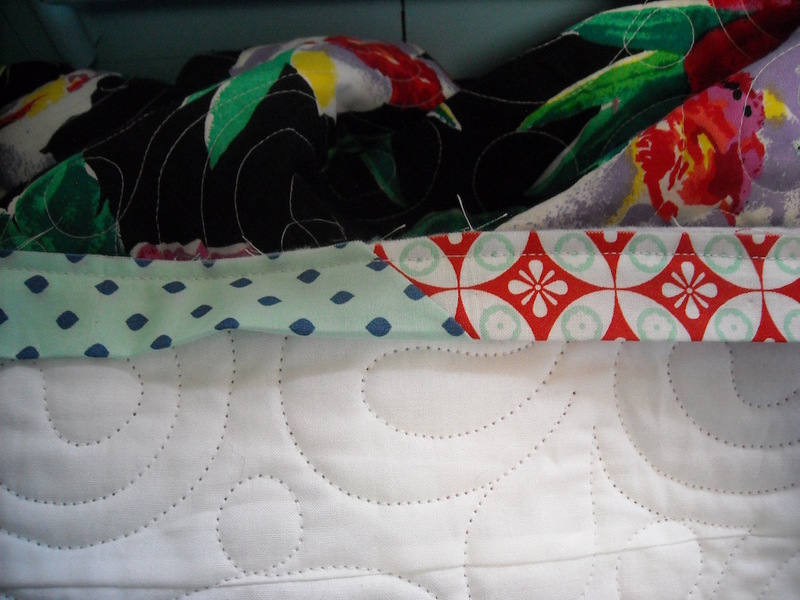 To do this, I lay my quilt out on my cutting table, which first requires a cleaning session in the sewing room because I never have that large a space cleared off for very long! 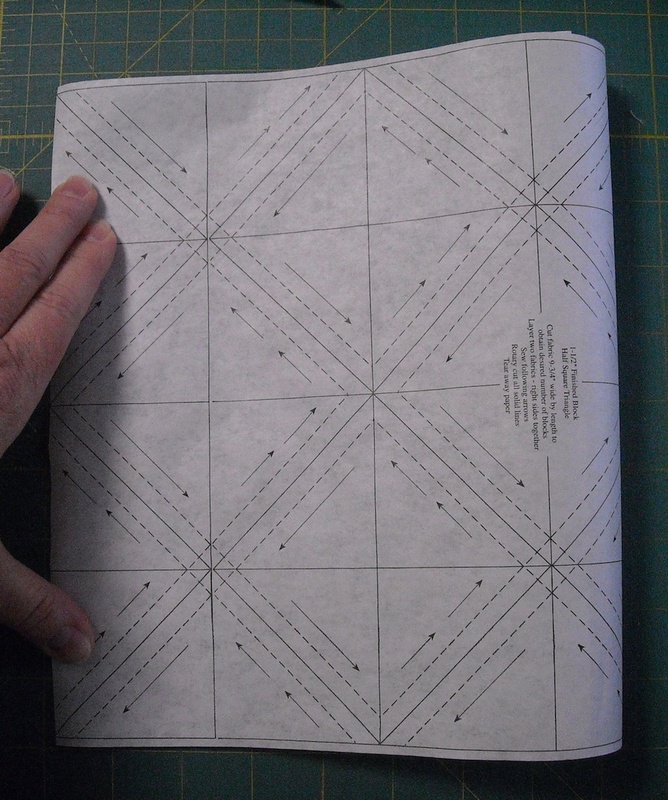 I use my 6″ x 24″ ruler, and lay it along the edge, making sure the edge is straight underneath the ruler. 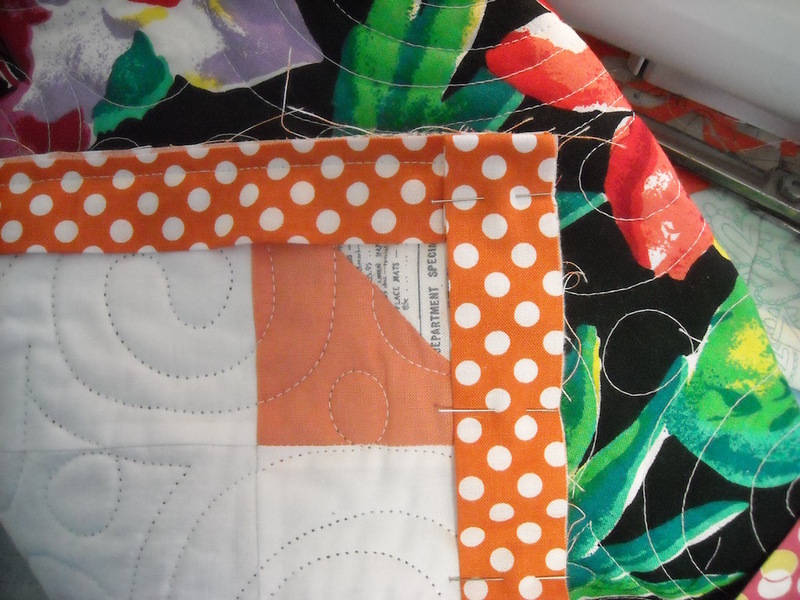 If my quilt has a border attached, this is easier, because I use the seam of my border to help line things up straight. Once I have it lined up, I cut off whatever’s sticking out. 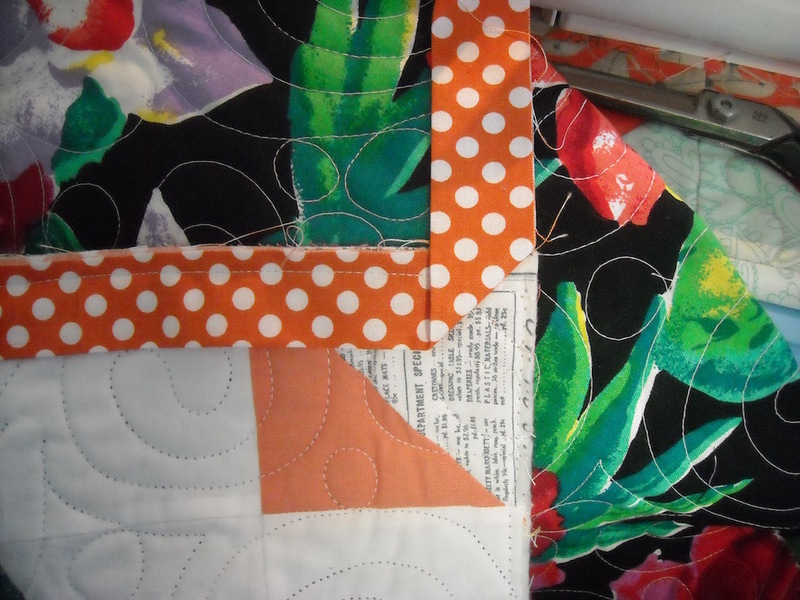 Do this for each side of the quilt, and then you’re ready to bind! 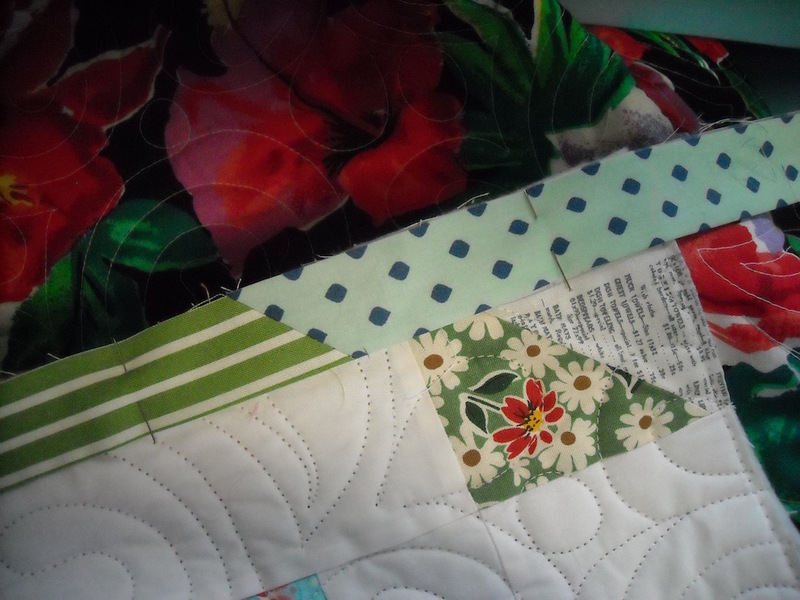 I generally start about 1/3 of the way up from a corner on any side of my quilt, and leave about a 12″ tail of the binding hanging loose (for joining up at the end). 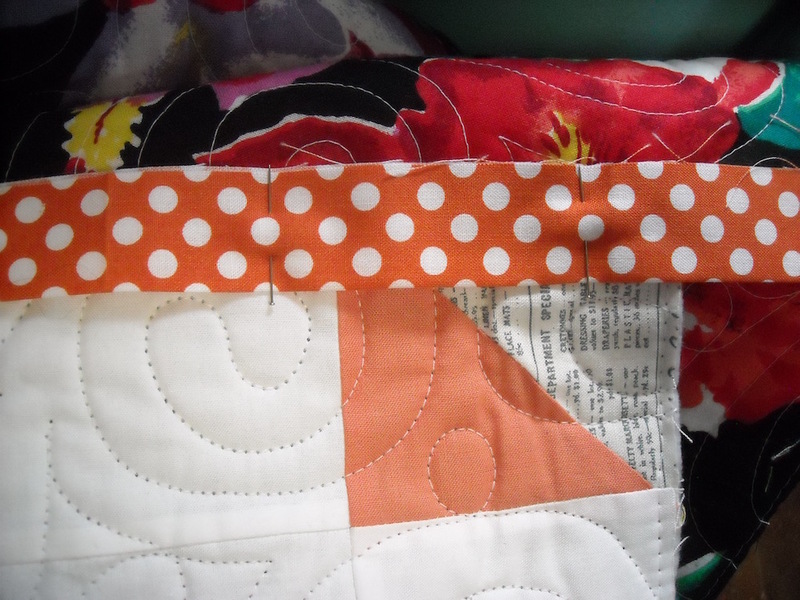 Start pinning and pin the raw edges of the binding strip even with the raw edge of the quilt, all the way to the first corner. 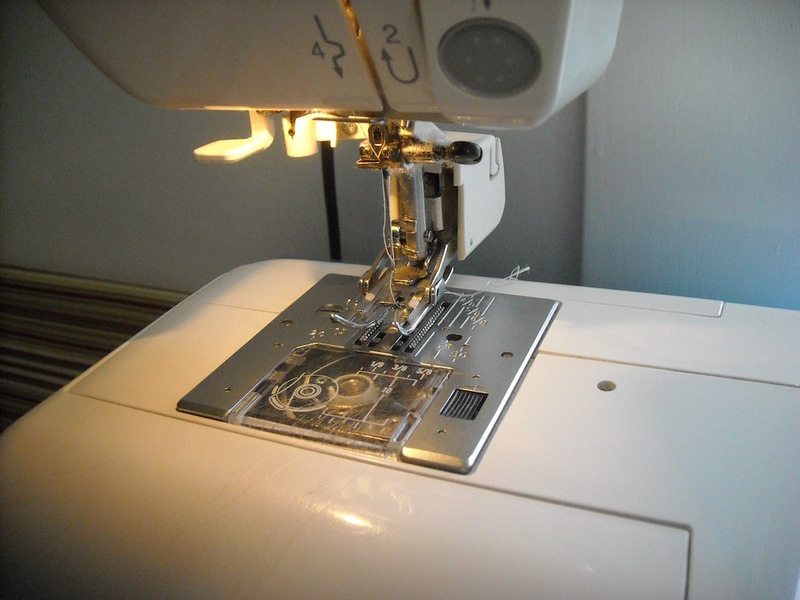 Start your stitching close to your first pin, and backstitch to secure it. 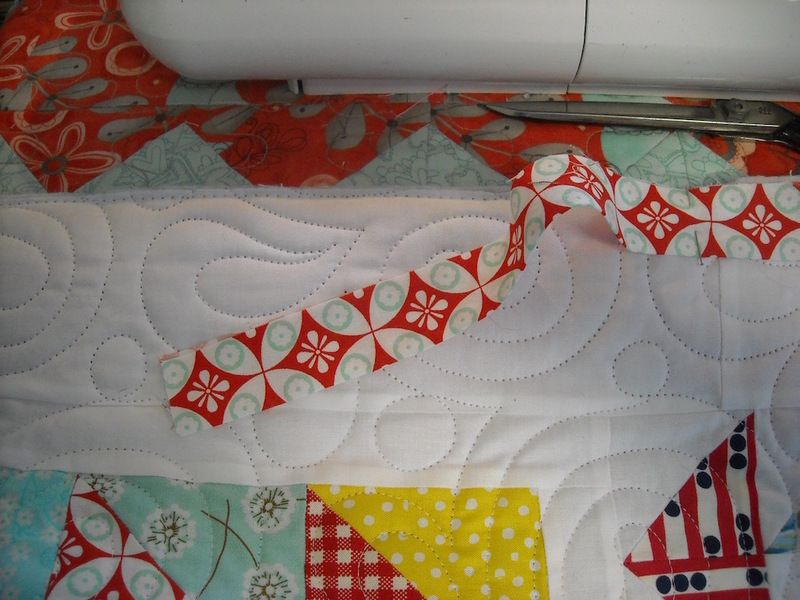 I use a seam width that is just a bit larger than 1/4″. It’s about halfway between 1/4″ and 3/8″, which would technically be 5/16″. You can use whatever feels right to you. Also, I’ll just be honest right now and tell you: I sew over pins. A lot. Don’t judge! 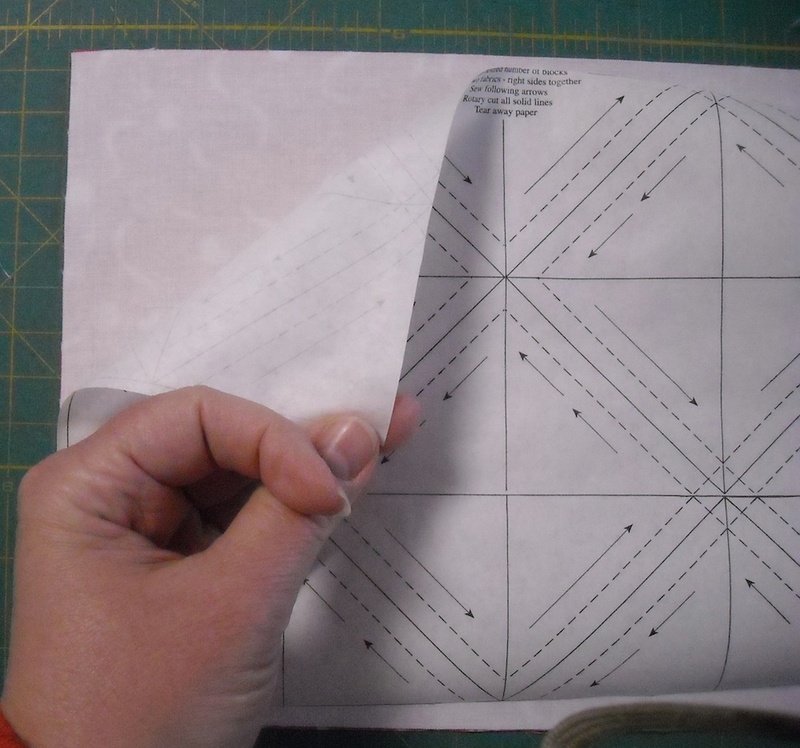 Sew down to the first corner, but halt your stitching 1/4″ from the very end, and backstitch. Cut the thread. 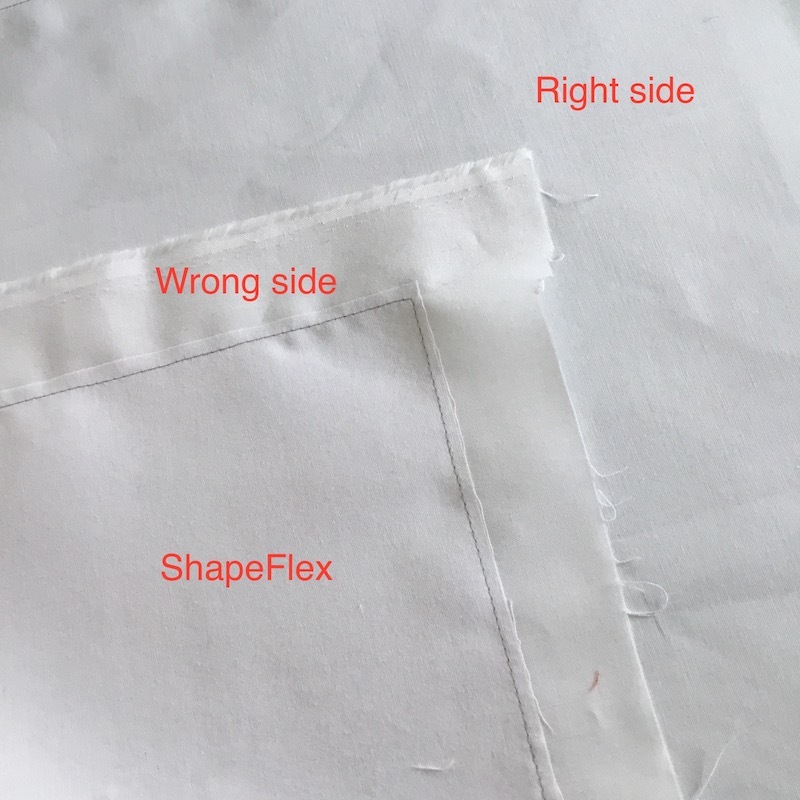 If you encounter a situation where a seam in your binding strip lands right on a corner, this is not a good thing. 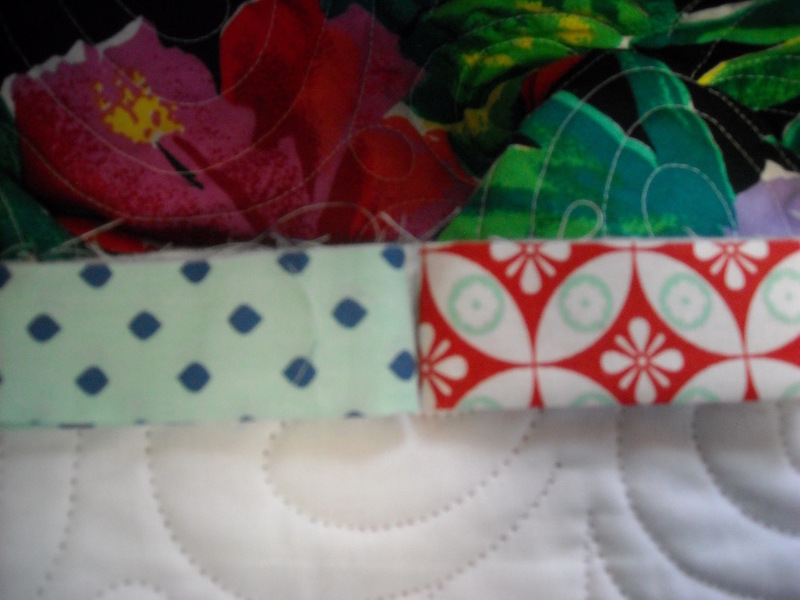 While it can happen with any binding, there’s a much higher probability that it’s gonna happen with a scrappy binding, simply because there are more seams where the strips are joined. This problem is easily fixed. 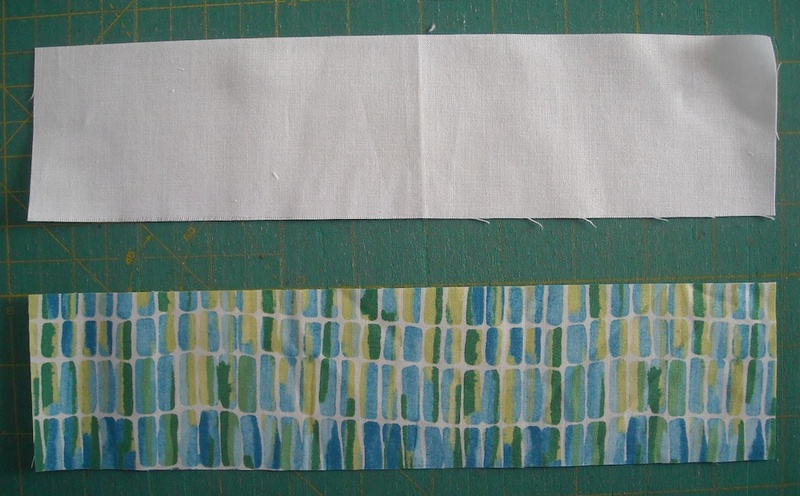 Simply cut the strips apart, cut a little of the length off of the strip that’s getting sewn down (the green one in this example), and rejoin the strips so that the seam lands a bit further up the side. Then proceed as usual. Now we’re going to fix that nice mitered corner. 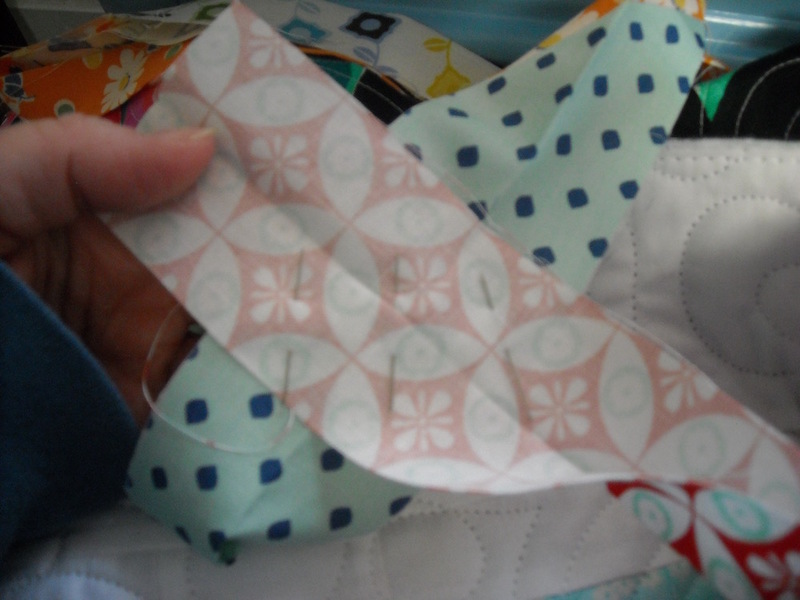 Fold the strip up at an angle, and in a straight line with the next side you’ll be stitching, as shown. Then fold it back down on itself, making sure to hold that fold in place. Pin it so it doesn’t move. Then pin all down the next side. When you’re ready to start stitching the next side, start 1/4″ in from the top edge, and carefully back stitch or lock stitch in place. 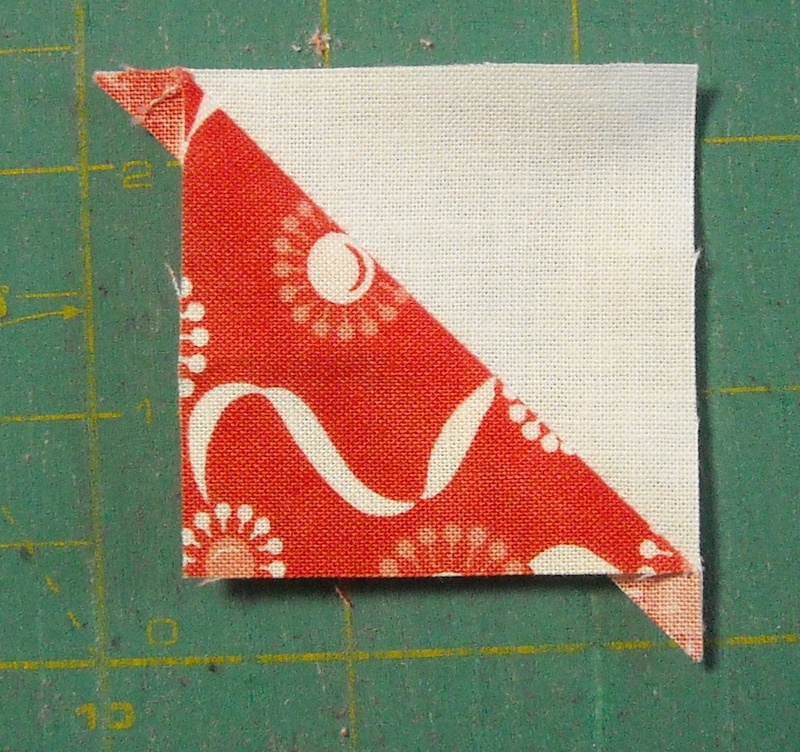 Then sew all down the next side, stopping 1/4″ from the corner as before. You’ll end up with this little foldy thing in each corner, just the way you want it! Repeat this all the way around the quilt. 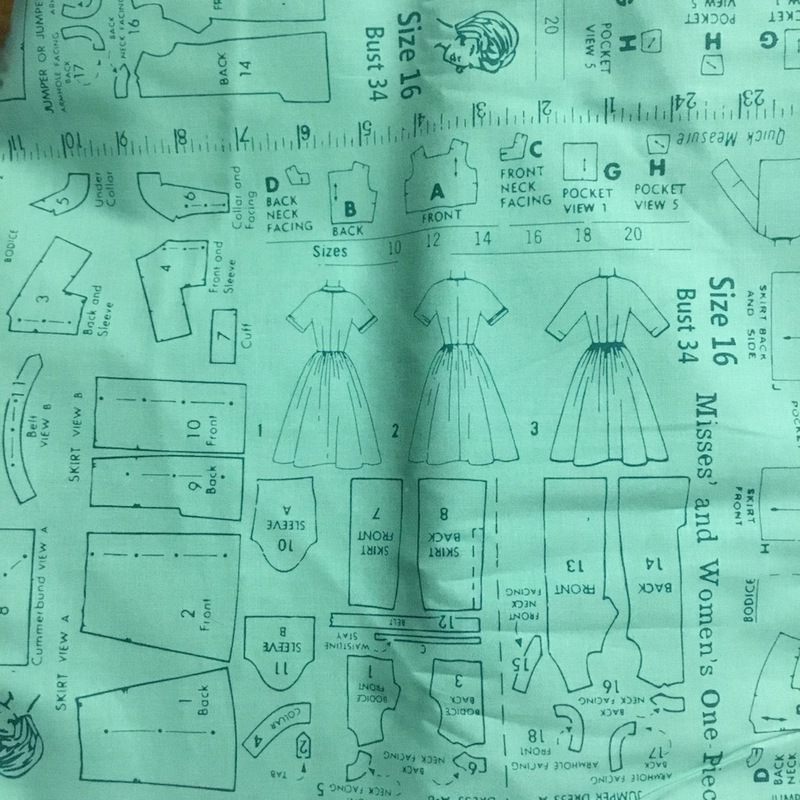 When you get back to the side you started on, sew the binding on as usual, but stop stitching so that you leave a gap about 12″ between where you started and where you’re stopping. 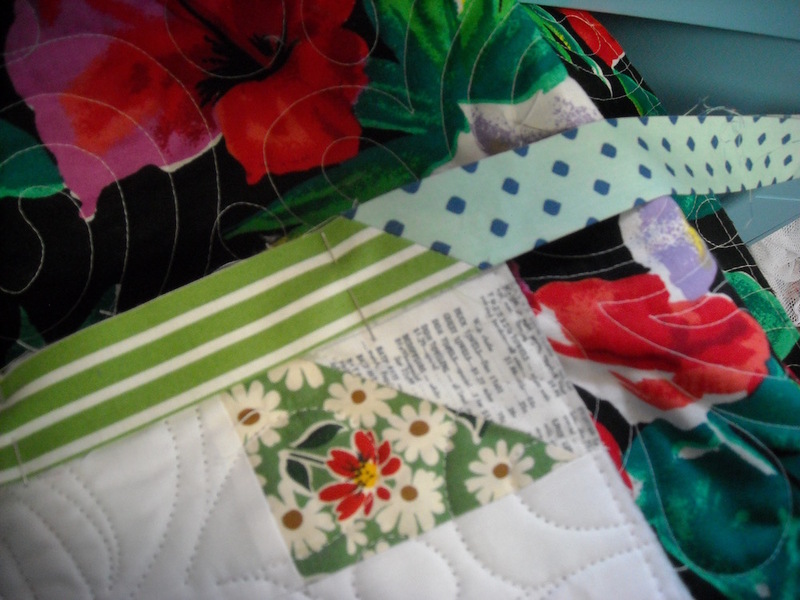 Backstitch to secure the strip to the quilt top, and cut the thread. Now it’s time to join those tails so that no one can tell where you stopped and started. Fold the two tails back on themselves at the point where they meet up with each other. Finger press a crease at this point in both strips. I just hold them in place and finger press them right where they’re meeting up. Open up the strip on the left, and position it right side up. Open the right-hand strip up so that the two strips are lined up with both creases matching (like a + sign) right sides together, and pin in place. I use three pins to make sure they don’t move. 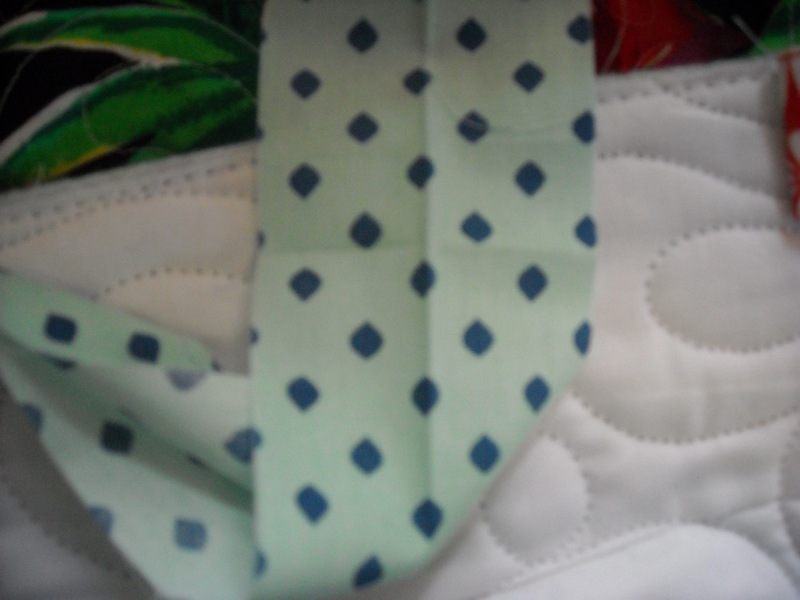 The stitching should run right through the middle of the + sign made by the creases on the strips. 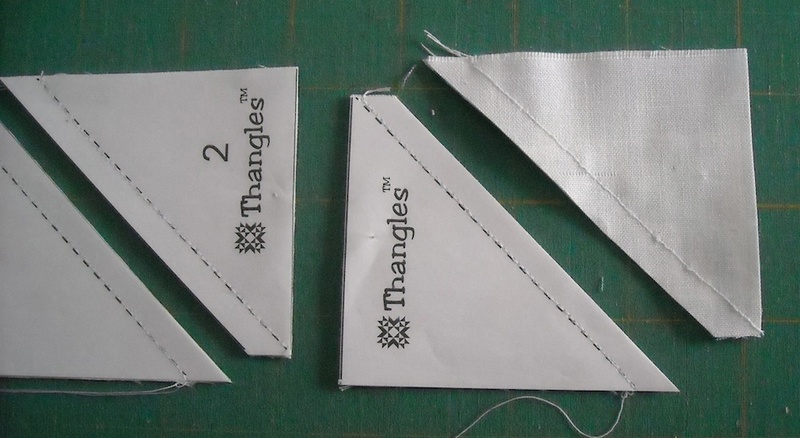 Both loose tails are above the stitching line, and will eventually get cut off. 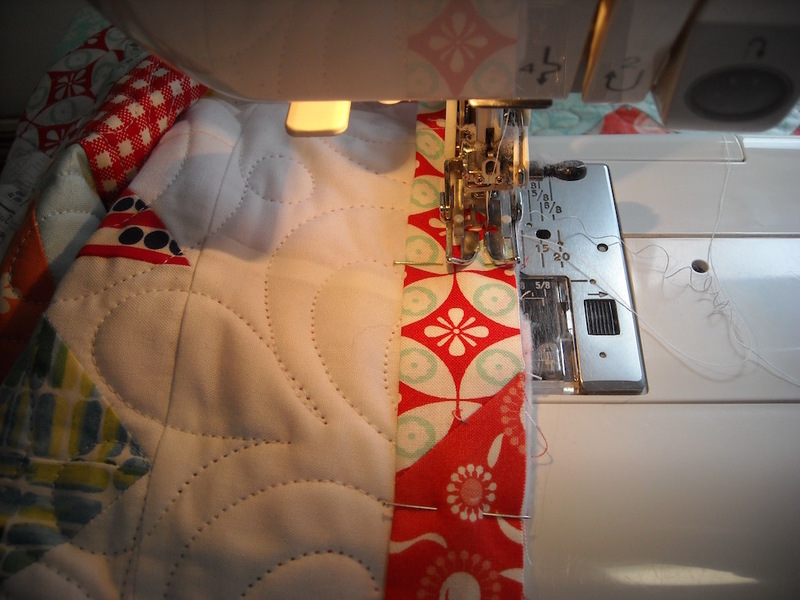 But don’t trim anything just yet — you’ll want to pull the binding back into place along the quilt’s edge, just to test and make sure you got the seam in the correct place and nothing is twisted. 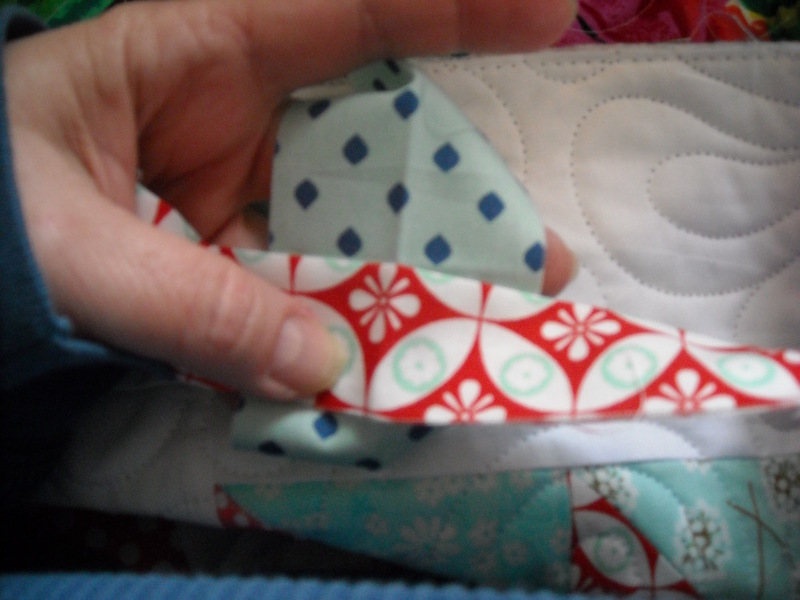 If you’re happy with the fit, unfold it and trim the excess binding off, 1/4″ outside the stitched line. 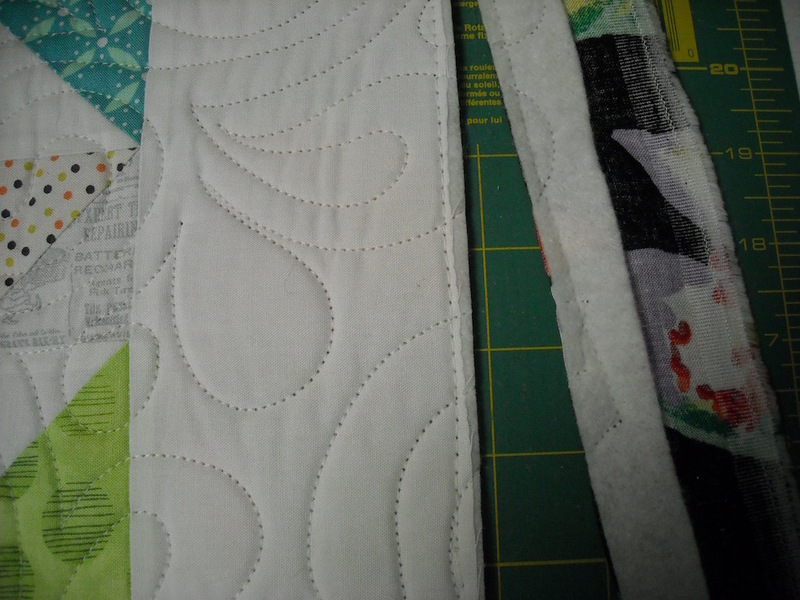 Finger press the binding seam, and fold the binding strip in half, and pin it to the quilt top along the remaining gap. Stitch in place to close the final gap, and no one will be able to tell where you stopped and started your binding! It’ll be your little secret! 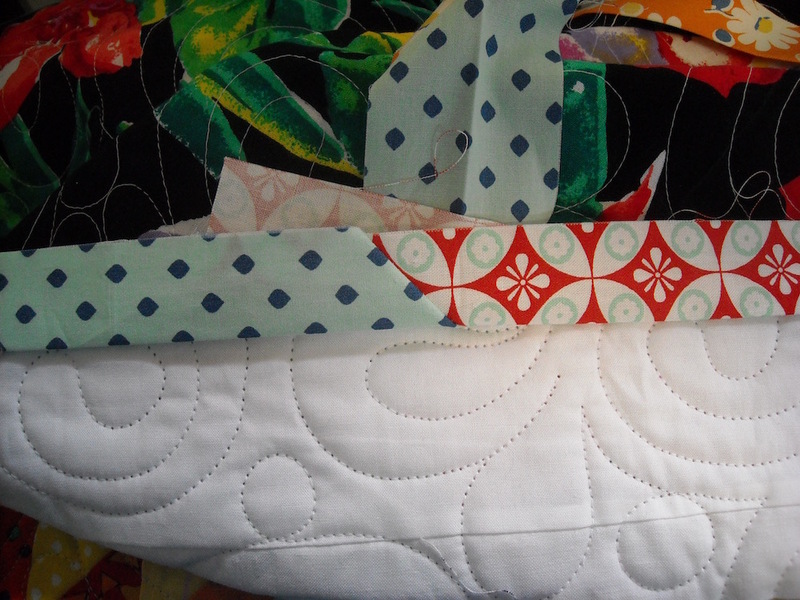 I’m gonna drag this out yet another day, and come back tomorrow to show you how I whip my binding down on the back side of my quilt, and how I make sure my corners are neat and mitered. And . . . we’ll talk labels a little bit. See you tomorrow! 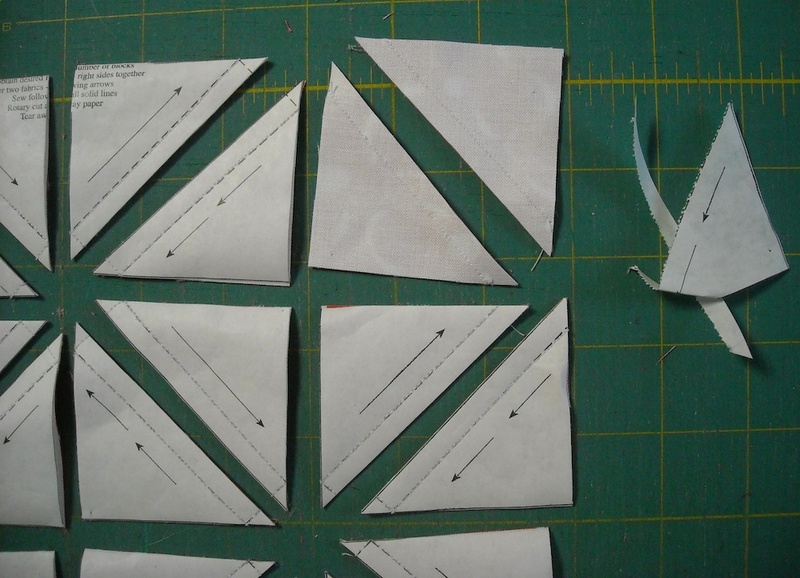 This is the final tutorial for making triangle squares! Next week, we’re gonna start making blocks out of all the units you’ve made so far — woohoo! For this last tutorial, we’re using Triangles on a Roll. The finished size of the ones we’re using is 1 1/2″. So that’s the size paper you’ll need to have. As with the other papers, the size you’re making determines how many are on each section of paper. Triangles on a Roll are just that — the paper comes on a roll, and you cut off how much you need for what you’re making. If you don’t have Triangles on a Roll paper, and don’t want to get any, simply go back to either Tutorial #1 or Tutorial #2 and use the formulas provided to make your units in the correct size for this week (1 1/2″ finished). If you’re using the paper, here’s the step-by-step instructions. 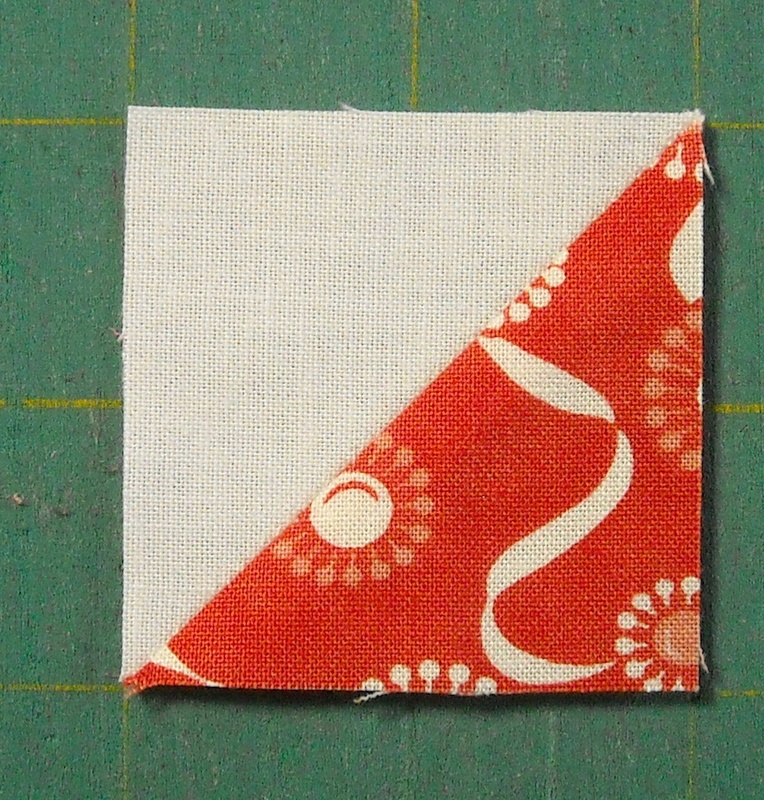 So cut two pieces of fabric 7 1/2″ x 9 3/4″, one from a print, and one from your background fabric. Layer these two pieces right sides together, and place the paper on top of it. Pin the paper in place on the fabric. 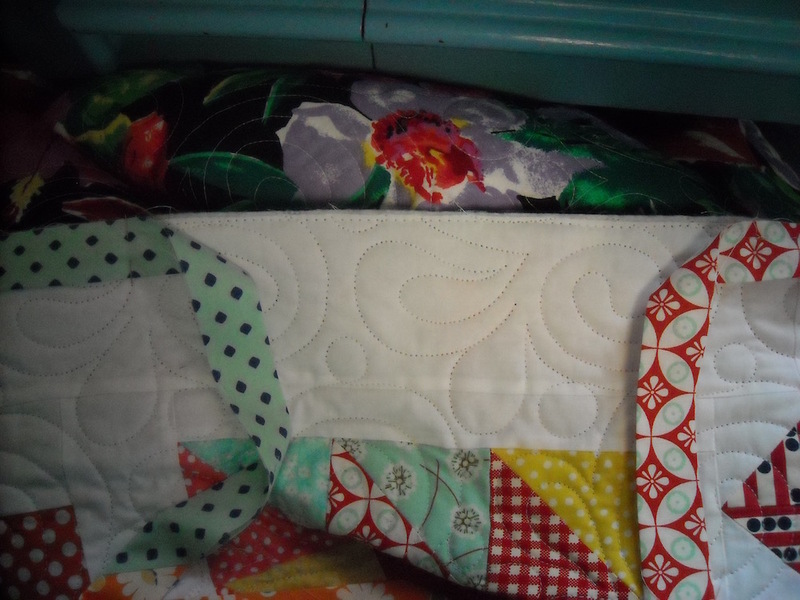 I used pins in all the open areas, so they’re not in the way of my stitching. Now for the sewing part. 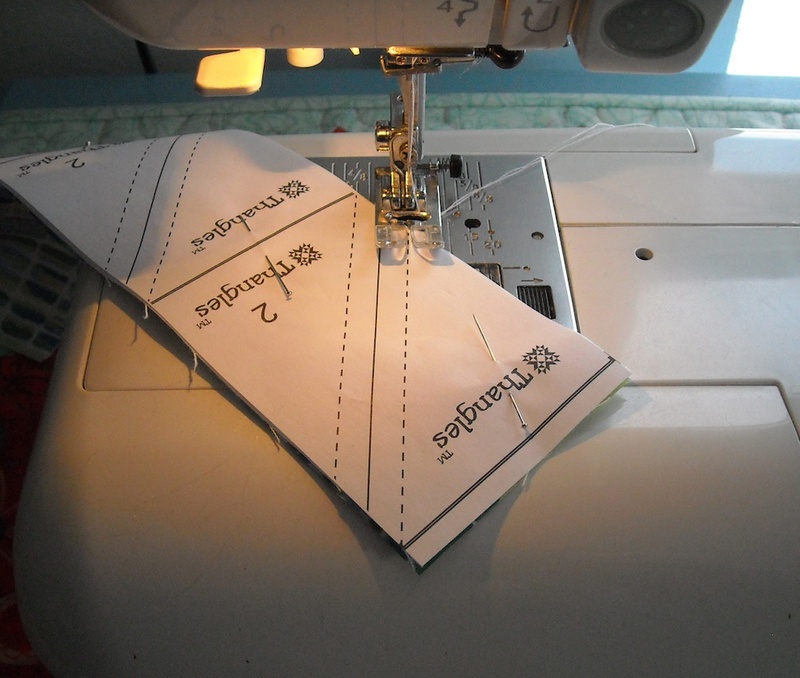 Again, I lowered the stitch length on my machine, to make the paper a little easier to tear off. 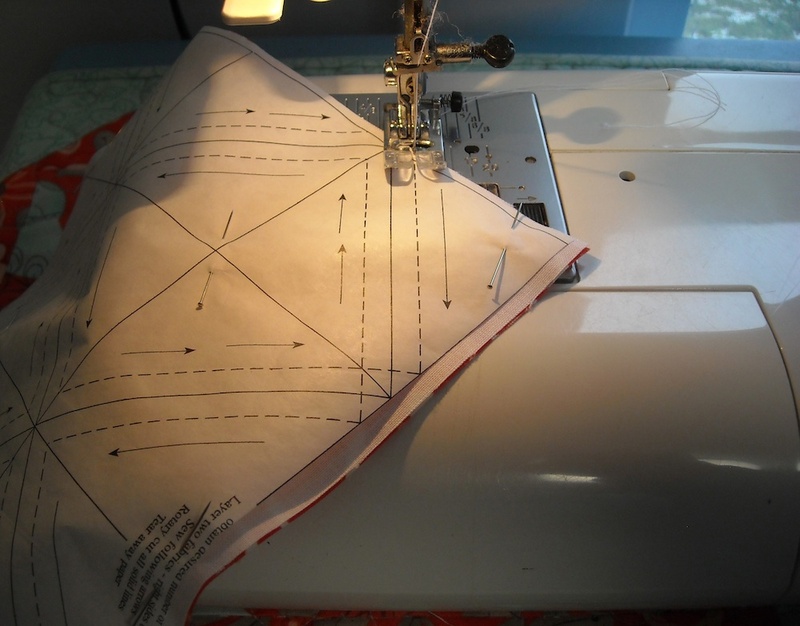 Choose a line to begin stitching on. Their instructions say to stitch in the direction of the arrows. However, that gets kind of chopped up sometimes, depending on how many rows you’ve chosen to use from your roll. So it’s really NOT that important to sew in the direction of the arrows, as long as you’re covering every dotted line with stitching. Also, you’ll notice that some of the dotted lines cross the intersections, and some don’t. 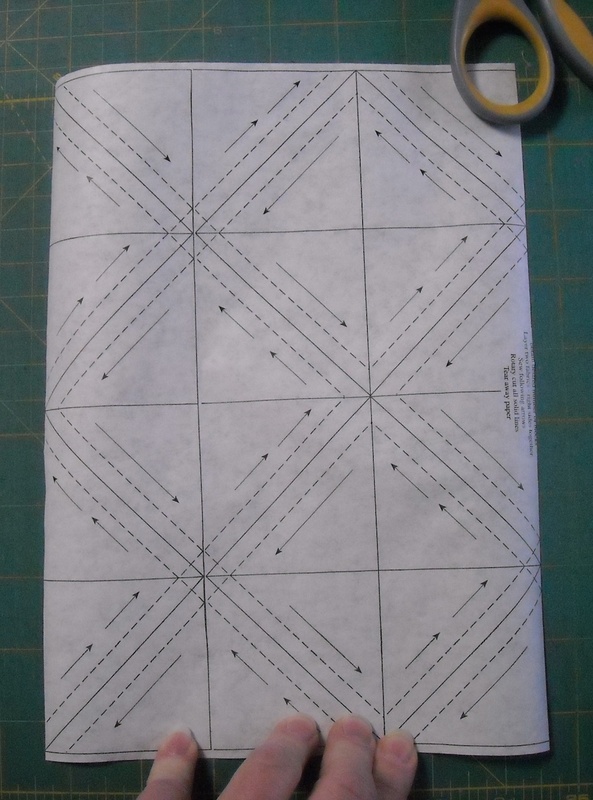 Where the dotted lines don’t cross the intersections, you can still pretend that they do, if it makes your stitching route easier. Just sew right on across — it won’t hurt a thing. 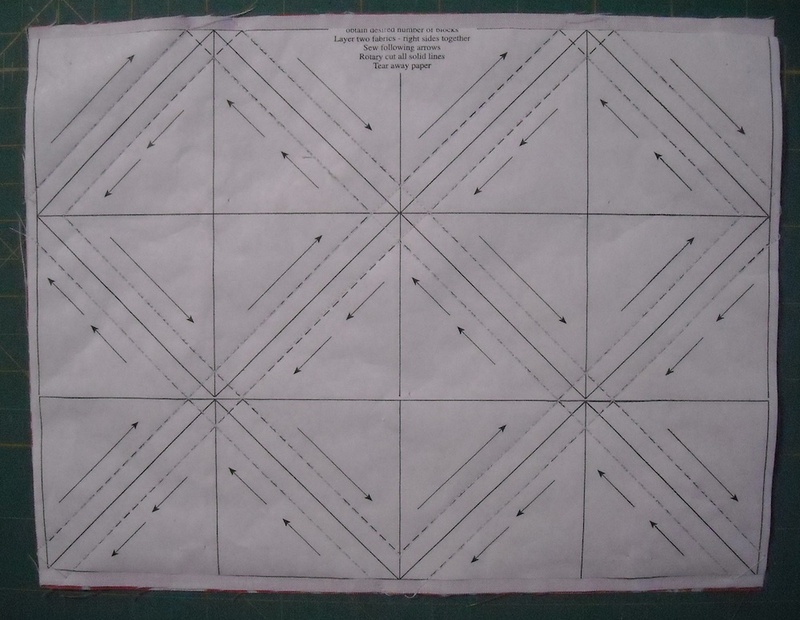 Once you have all the dotted lines covered with stitching, it’s time to trim. 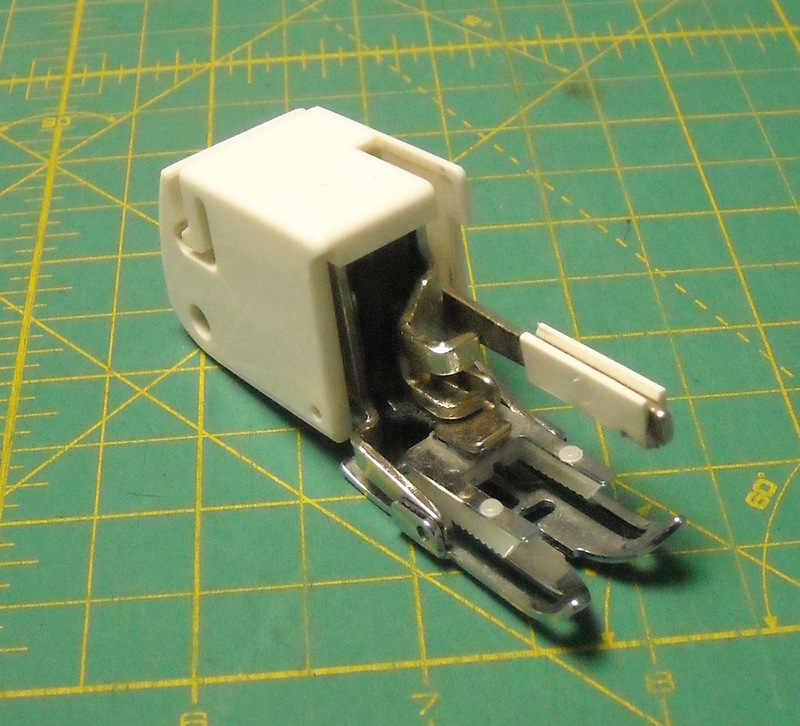 I ended up with 24 neat little units, lickety split, measuring 2″ each, very accurately. I also repeated it, using only one row off the roll, which works almost like Thangles! I ended up with 8 cute little units from this attempt. So you can use as many or as few rows from your paper as you like. Just decide how many units you want to be all alike, and go for it. You guessed it, there’s no formula for this method, either. You just have to purchase the size paper you need! There’s no drawing lines on the backs of the squares. If you need a lot of units, and it doesn’t matter if there are several that are all alike, this is a very good method to use. It allows you to use large pieces of fabric; no cutting tiny pieces. You have to purchase the roll of paper. If you need extreme variety in your project, and don’t want multiple units all alike each time, you’ll want to choose a different method. You have to tear the paper off the back of each one. If you use too many rows all at once, the piece gets rather unwieldy. 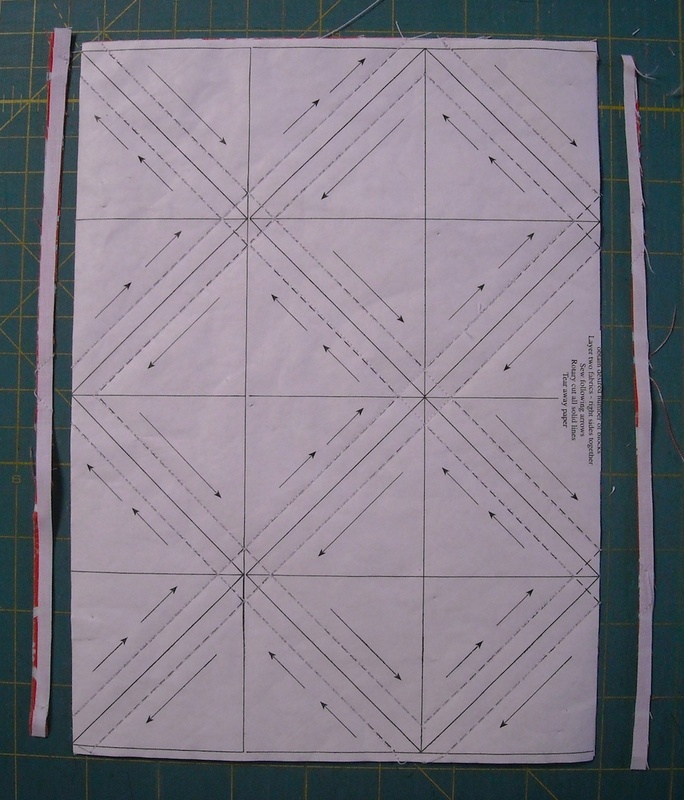 For the Triangle Salad quilt, the units we need this time should measure 2″ (unfinished), to finish at 1 1/2″ in the quilt, which means you need to use the 1 1/2″ Triangles on a Roll. You will need to make 32 units using a print fabric with a background fabric. If you chose to do 4 rows from your roll, you’d have them all in one attempt, and they’d all be alike. If you’d like a larger variety, you can split your rows up and use a different print each time. 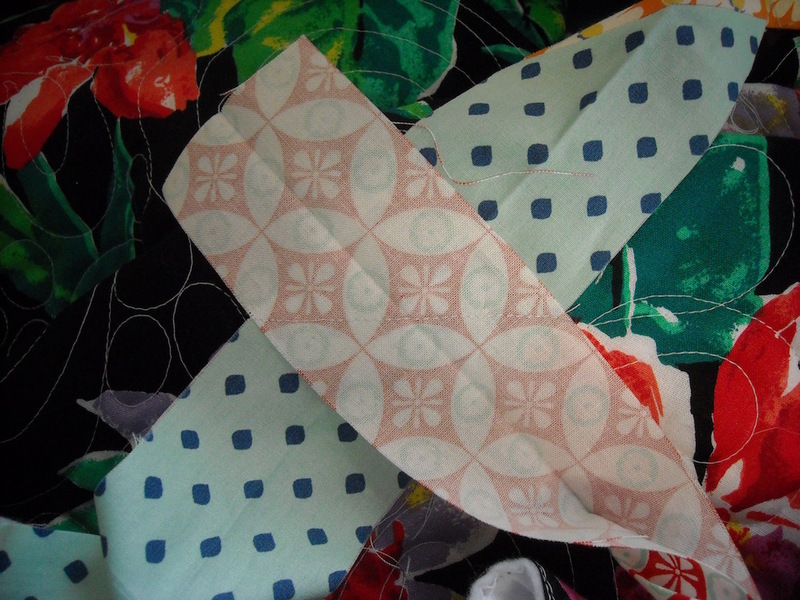 You will need to make 48 units using two print fabrics together. So this means you could use 6 rows from your paper and have them done all at once. 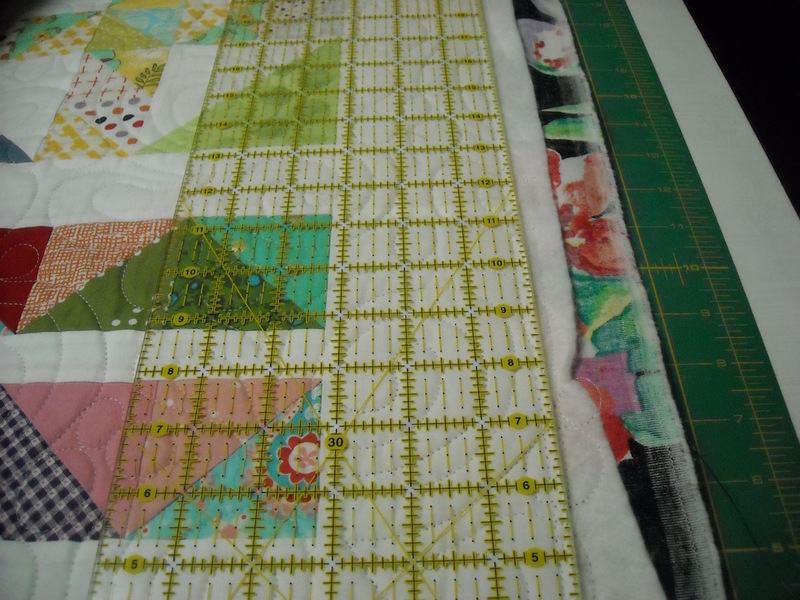 Or, for more variety, you can split the rows up and use different prints each time. 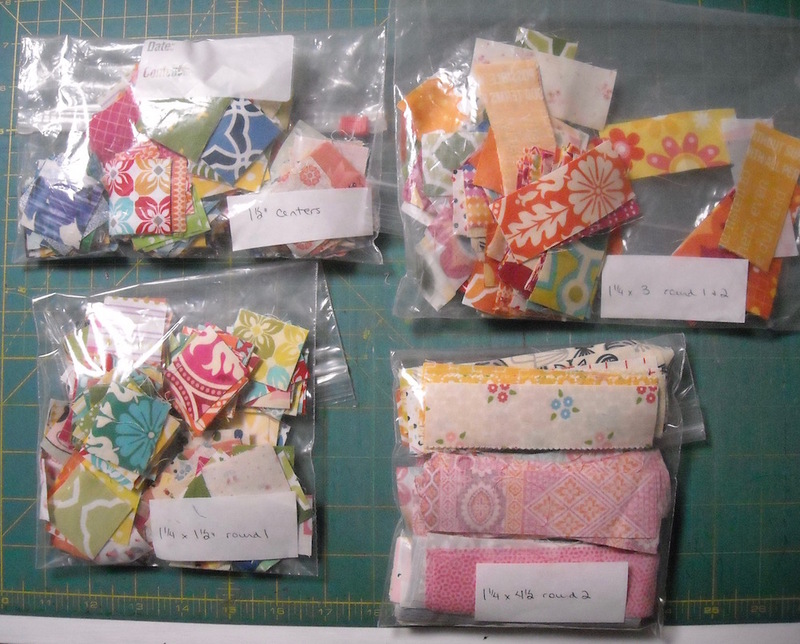 Store these 80 finished half-square triangle units in one of your ziplock baggies, and stick in with them the label that says 1 1/2″ Finished. 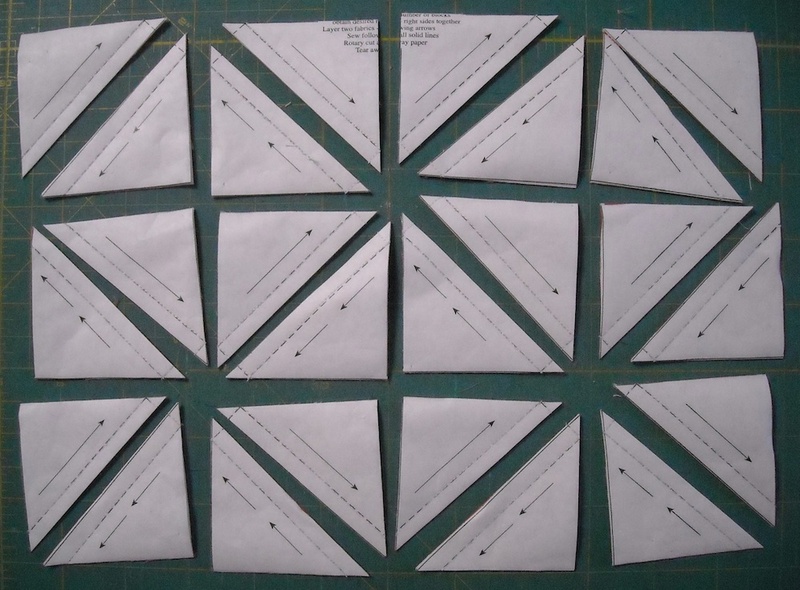 When you’re done with this tutorial, you’ll have made all the half-square triangle units you’ll need for your quilt. If you aren’t happy with the variety you have, simply make more! At the end, I’ll have a few suggestions for things you can do if you have any leftover units, so don’t be afraid to make as big a variety as you want from any of the sizes. That way, you’ll have plenty to choose from when making all your blocks. And next Monday, we’ll start making those blocks, so be sure and check back! Happy New Year! I hope your 2016 is off to a wonderful start so far. 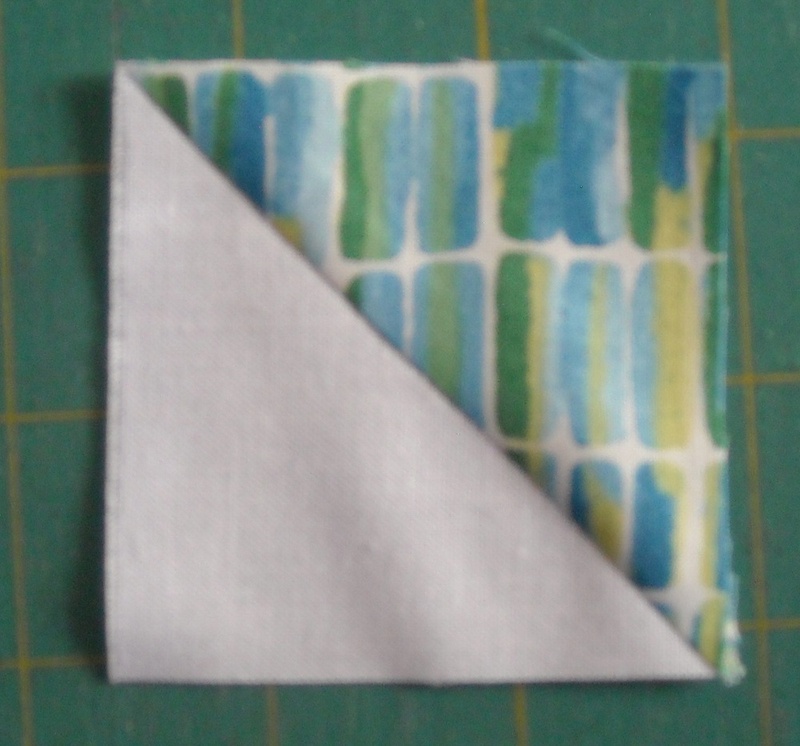 I’m back today with our fourth triangle-square tutorial. 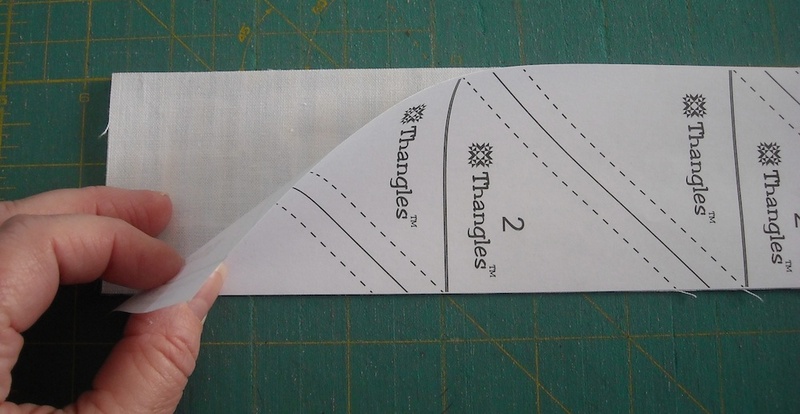 This week we’re using Thangles, in the 2″ finished size. Different sizes of Thangles produce different numbers of units, depending on the size you’re using, just to keep things manageable. The larger your units, the fewer you get from each paper. If you don’t have any Thangles papers, you can go back to either Tutorial #1 or Tutorial #2 and use the formulas provided to make your units in the correct size for this week (2″ finished). If you have the papers, and would like to use them, let’s get started . 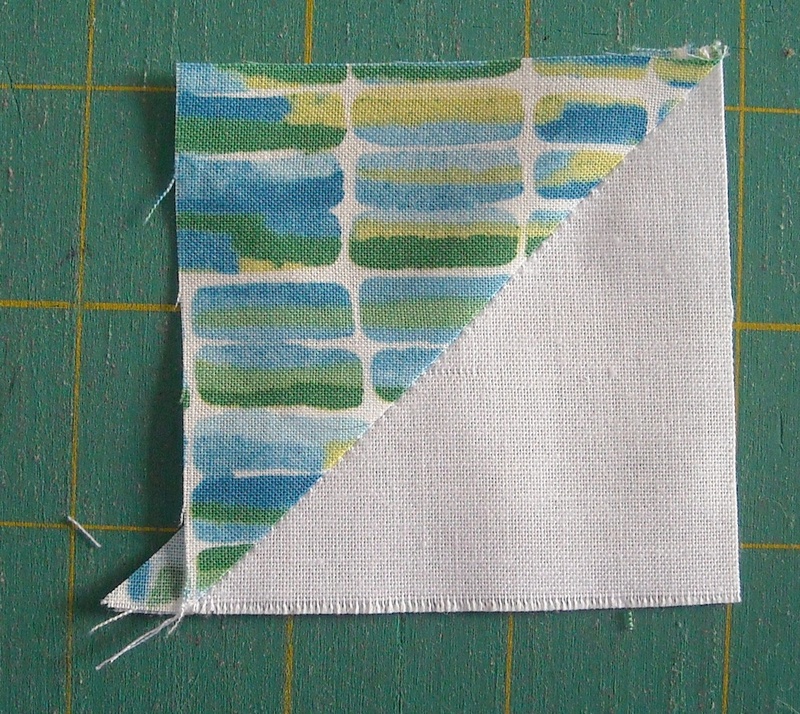 . .
You’ll need two strips, each measuring 2 1/2″ x 10 1/2″, one from a print and one from your background fabric. Place the two strips right sides together, with the lighter fabric on top, then place the Thangles paper right side up on top of the strips. 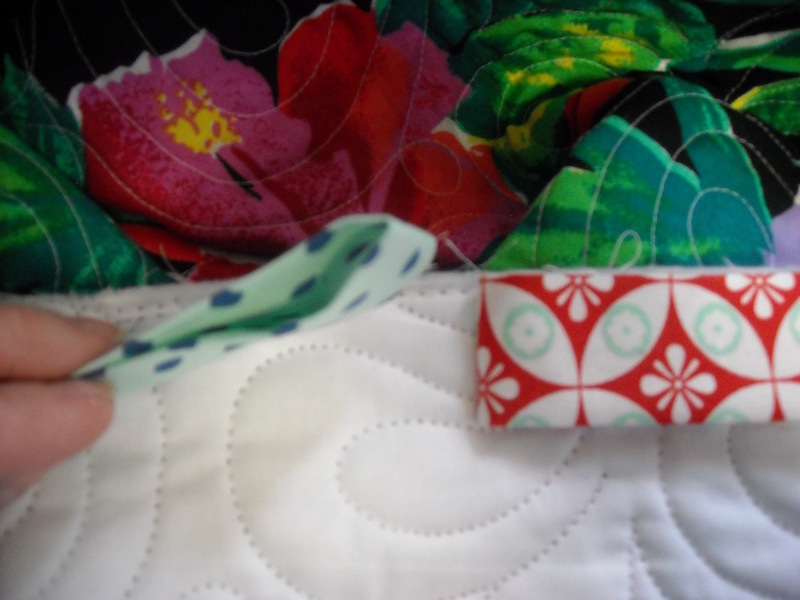 Pin through all the layers to hold it together while you sew. 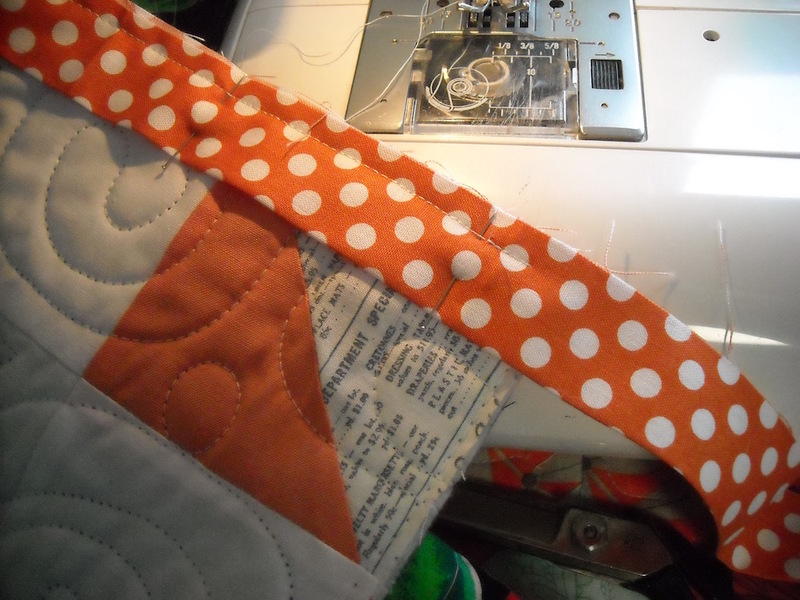 I pin out in the open areas so that the pins are not in the way of my stitching. Stitch on all the dotted lines. The Thangles folks say you don’t necessarily have to reduce your stitch length, since the paper is made for tearing, but I lower it just a tidget anyway. 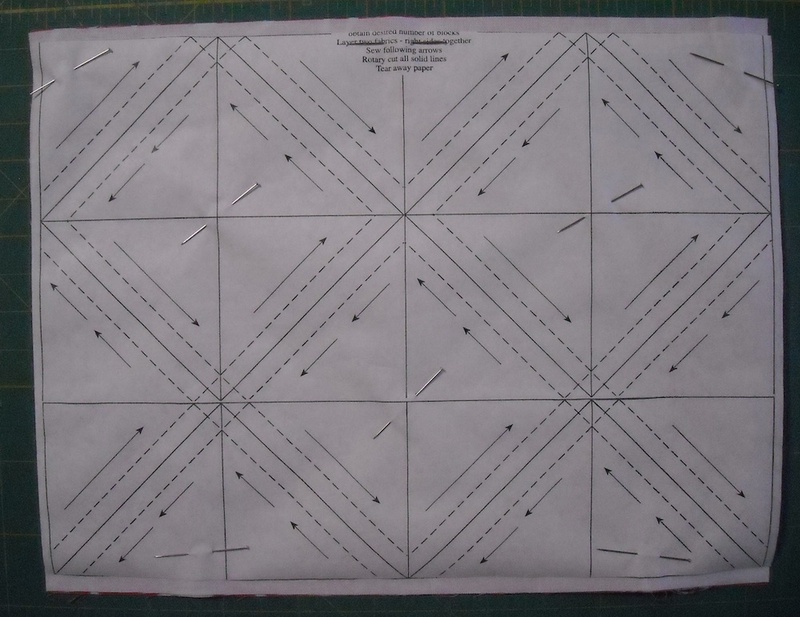 Once you have all the dotted lines stitched, you can remove your pins. Cut on all the solid lines, remembering to cut off the very ends of the paper on those solid lines as well. 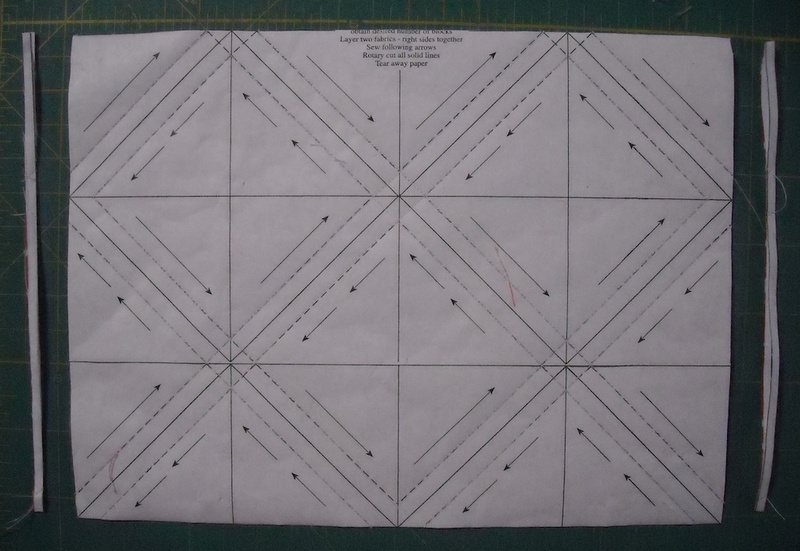 Cut on the diagonal lines between the dotted lines, and you’ll have 6 pieces. Trim off the dog ear — you’ll notice with this method that there is only one dog ear to trim from each unit! 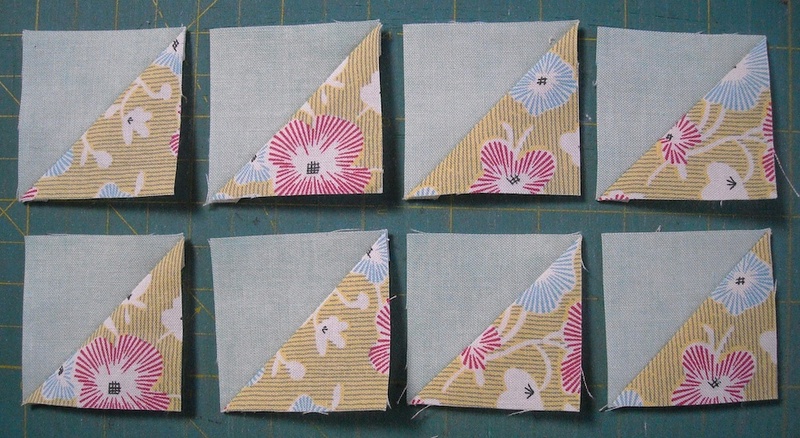 And now you have 6 finished cute little half-square triangle units, each measuring 2 1/2″ unfinished, to use in your quilt! There’s no formula needed for this method, either. Simply choose the appropriate size of Thangles papers, and the instructions are included inside the package! If you need a lot of units, and it doesn’t matter if there are several that are all alike, this is a good method to use. 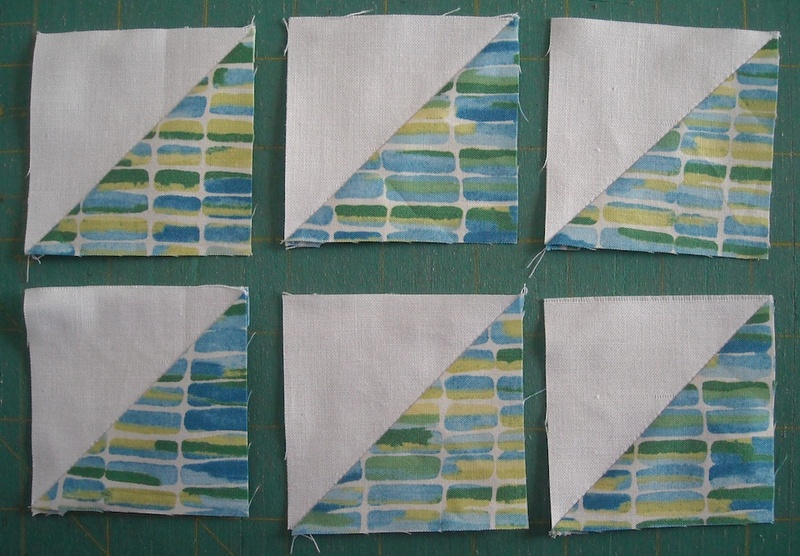 If you already have strips cut in the proper size, it allows you to use those without having to cut more. Jelly roll strips work great with the 2.0 size! You have to purchase the papers. 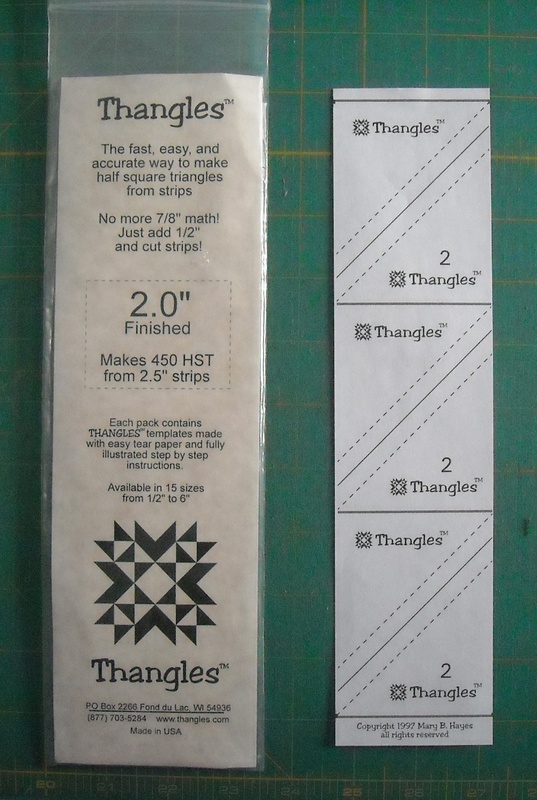 For the Triangle Salad quilt, the units we need this time should measure 2 1/2″ (unfinished), to finish at 2″ in the quilt, which means you need to use the 2.0 Thangles papers (see the first picture in this post for what the package looks like). 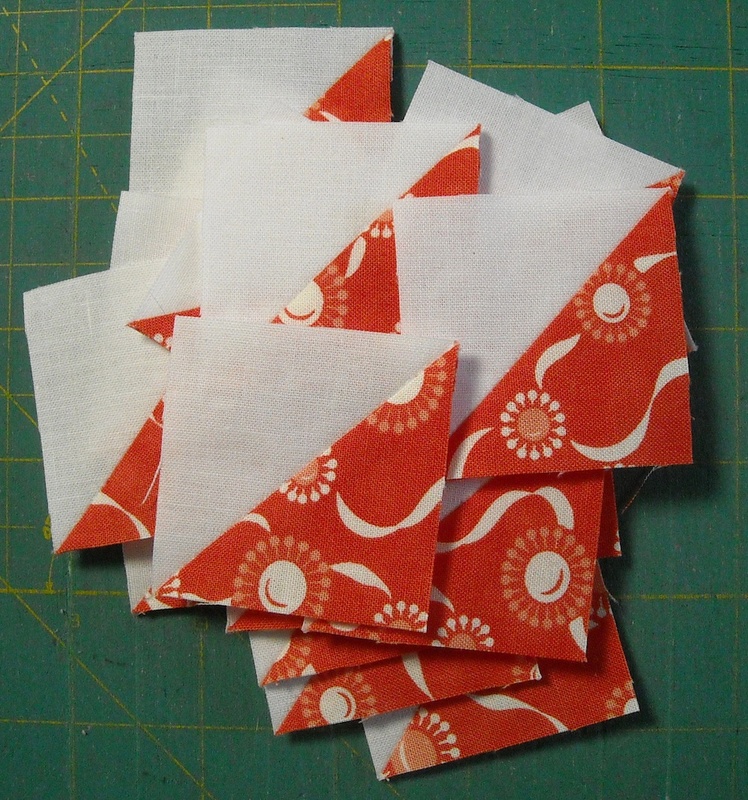 You will need to make 58 units using a print fabric with a background fabric. So this means you need to do the above process ten times, using a different print with your background fabric each time. You will have 2 extra units, but go ahead and put those in your baggie for now. 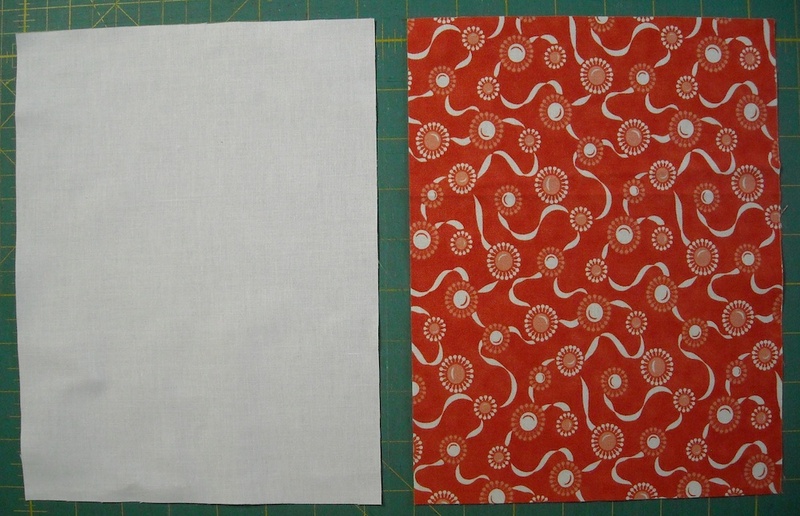 You will need to make 22 units using two print fabrics together. So this means you need to do it 4 times using 2 different print fabrics each time. Again, you will have 2 extra units, but keep them for now. Store these 84 finished half-square triangle units in one of your ziplock baggies, and stick in with them the label that says 2″ Finished. You’ll only need 80 of them, but we’ll worry about that later. Have fun! Check back next Monday for Tutorial #5. It’s the final tutorial before we start putting our blocks together — woohoo!